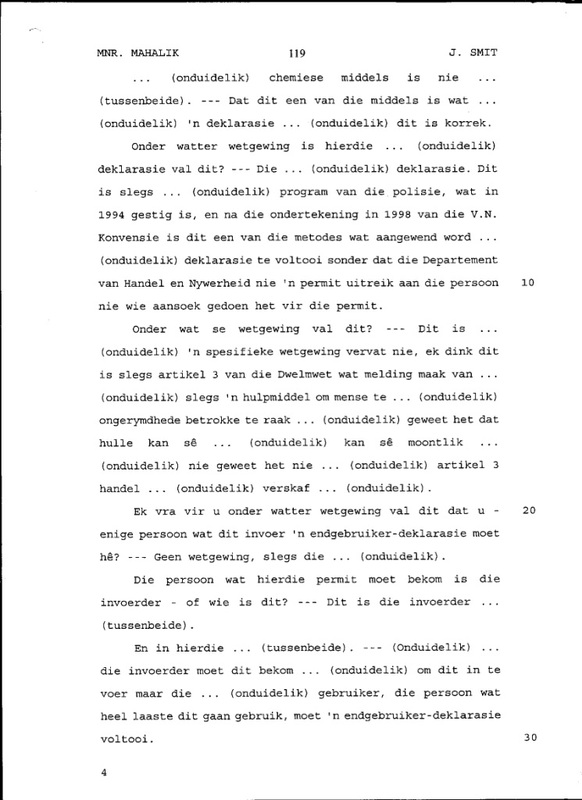 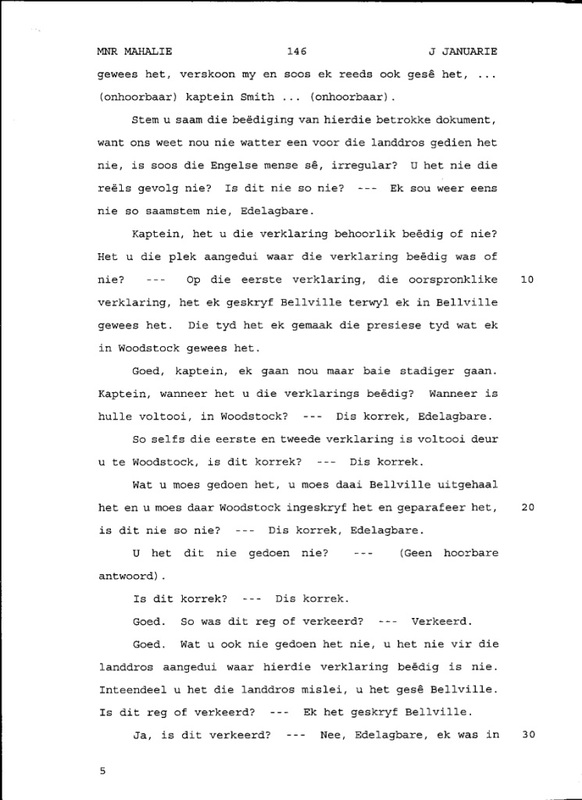 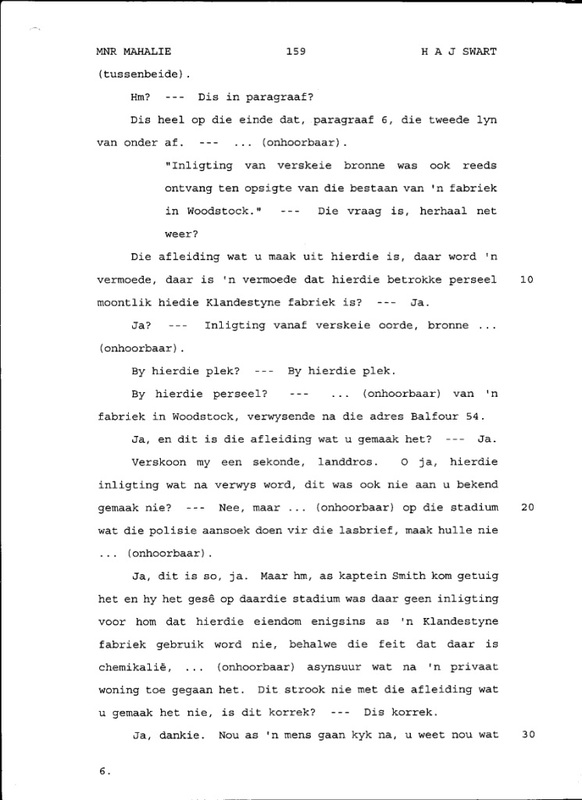 What follows below are the trial transcripts from the first criminal trial with questions and answers to and from the arresting drug policeman, one of his colleagues present at the search and also questions and answers to and from the magistrate who authorized the search warrant. 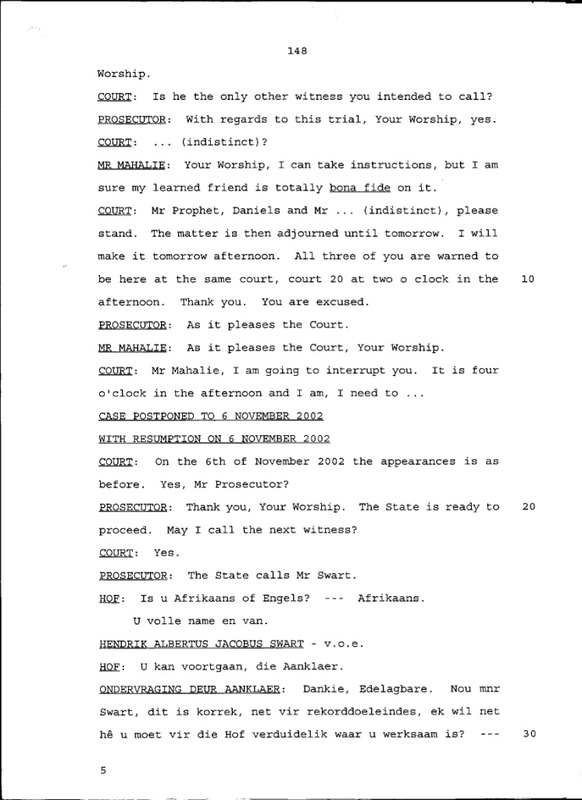 Magistrate Matthews was the magistrate. 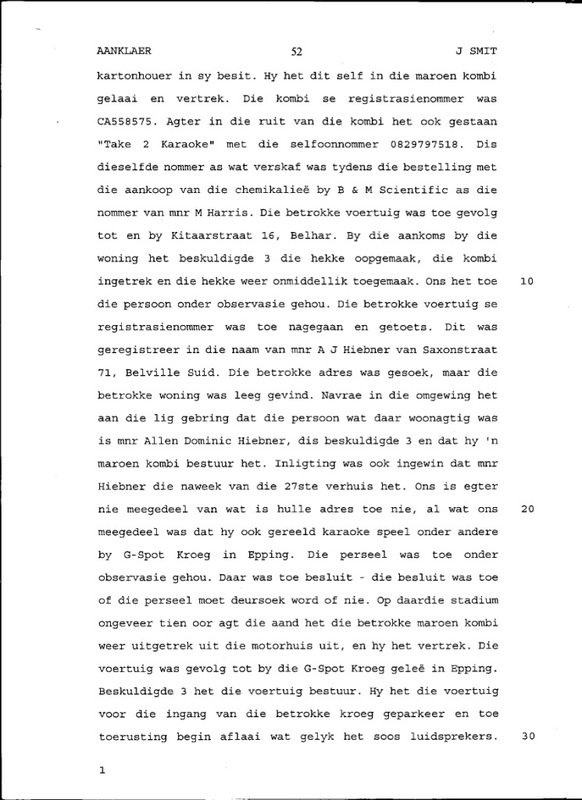 Sylvester Vogel and William Fischer were representing Alan Hiebner. 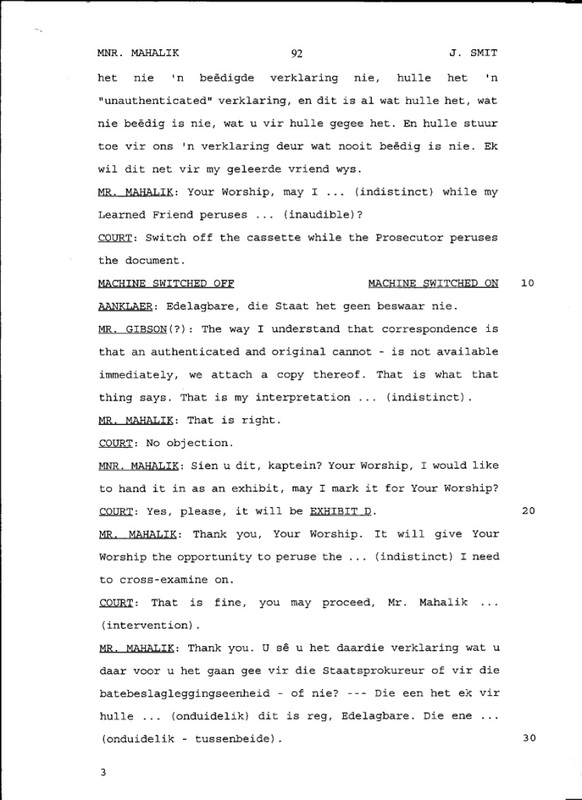 Norman Snitcher and Piet Mihalik represented me and Nicola Daniels. 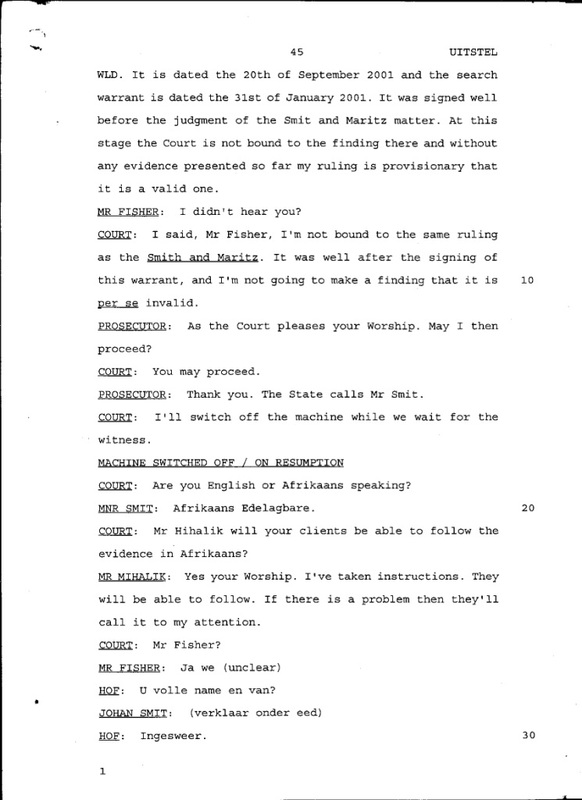 All of us as the accused put in pleas of not guilty. 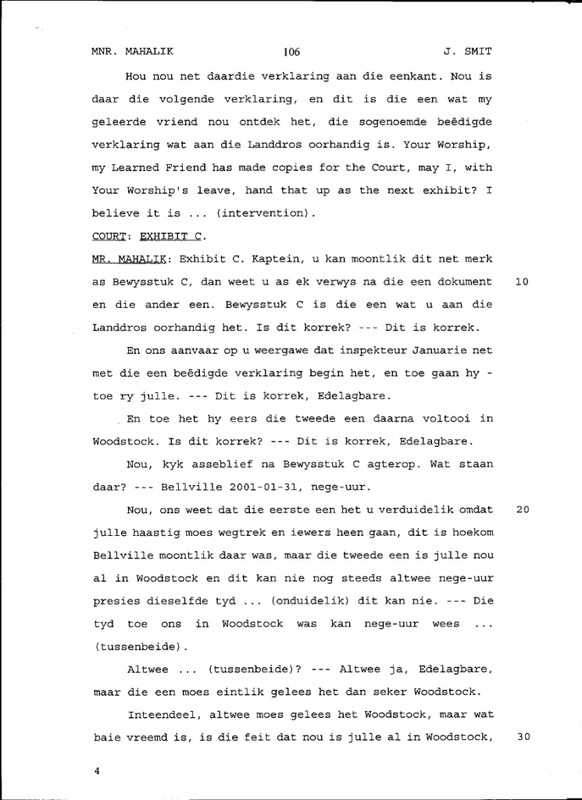 In this trial all of us being the accused were acquitted on grounds of a technicality when one of the assessors refused to participate further in the trial and the trial was set aside. 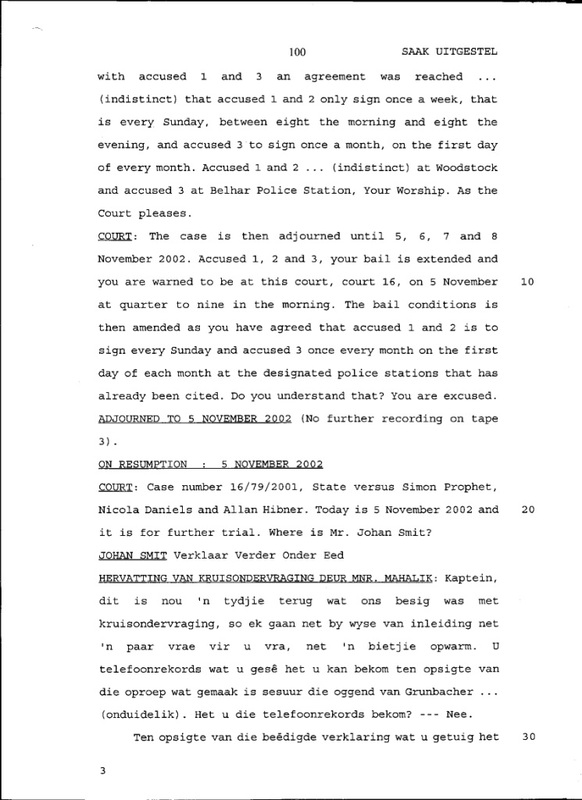 So in this trial who is right and who is wrong? 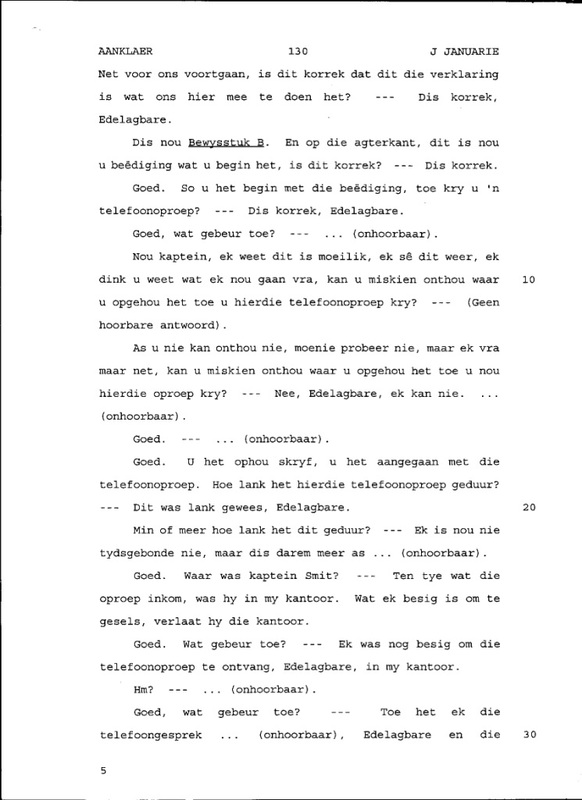 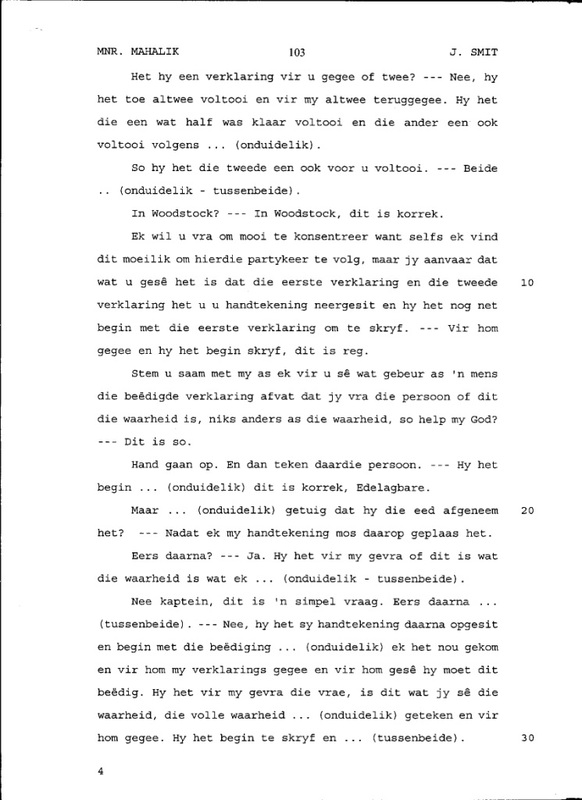 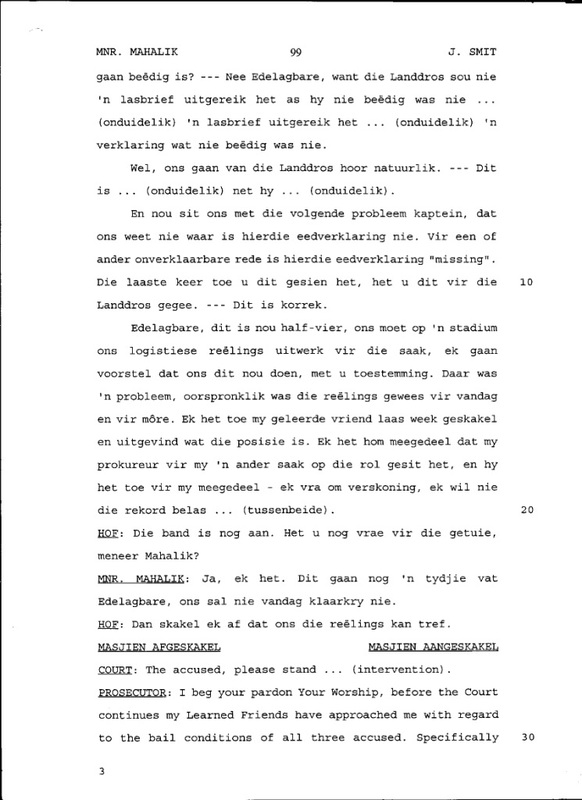 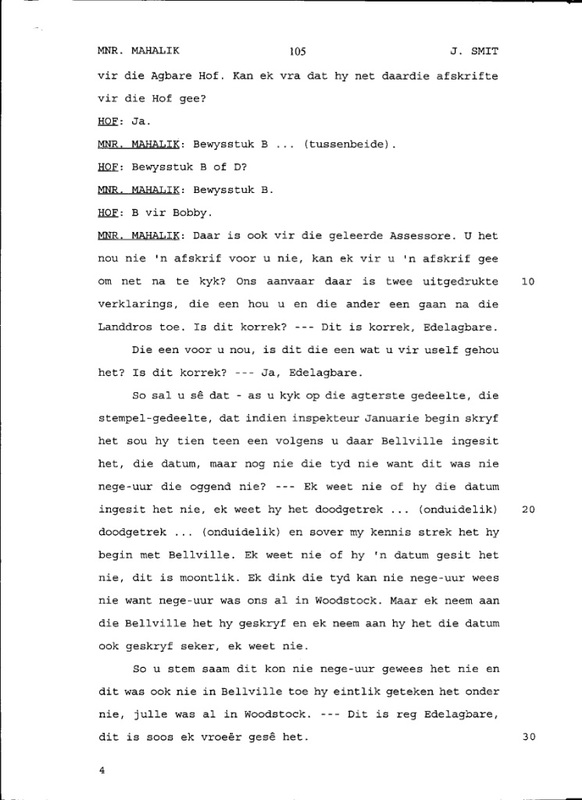 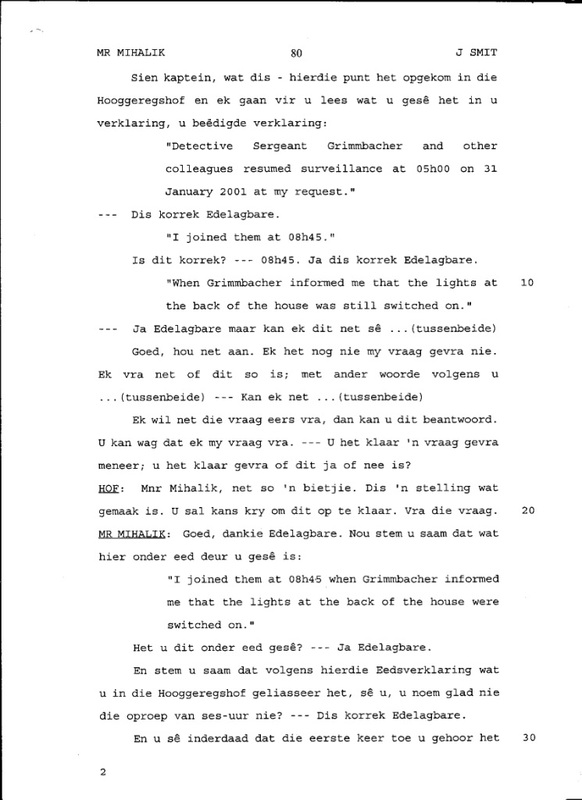 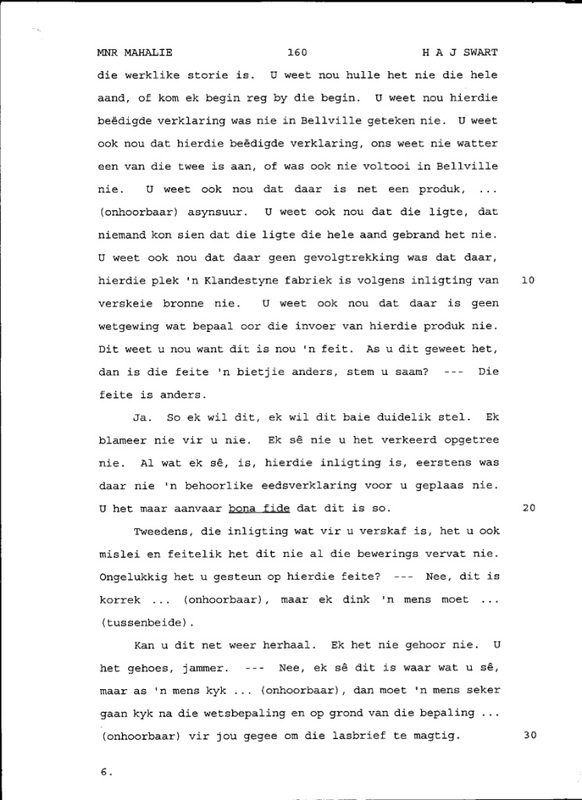 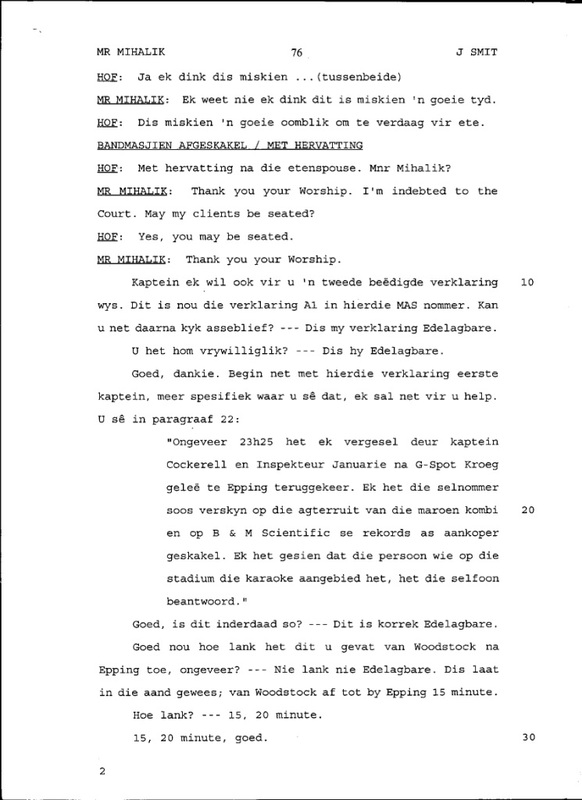 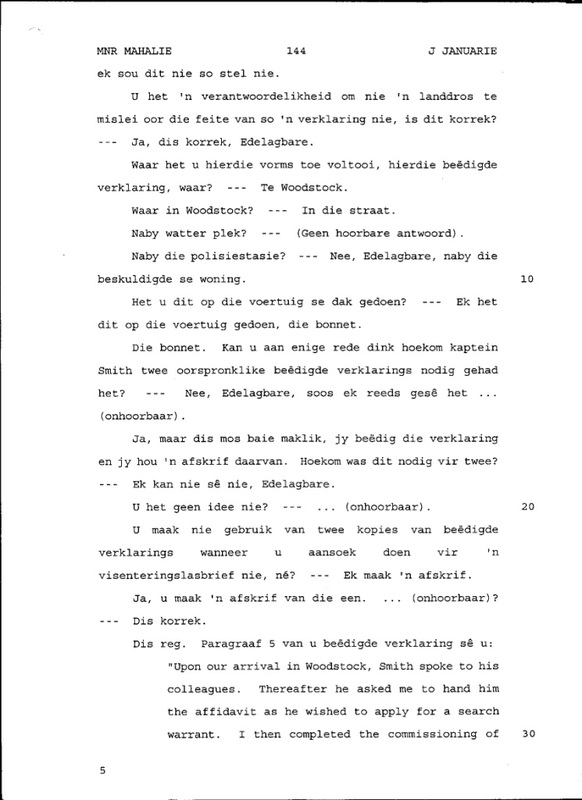 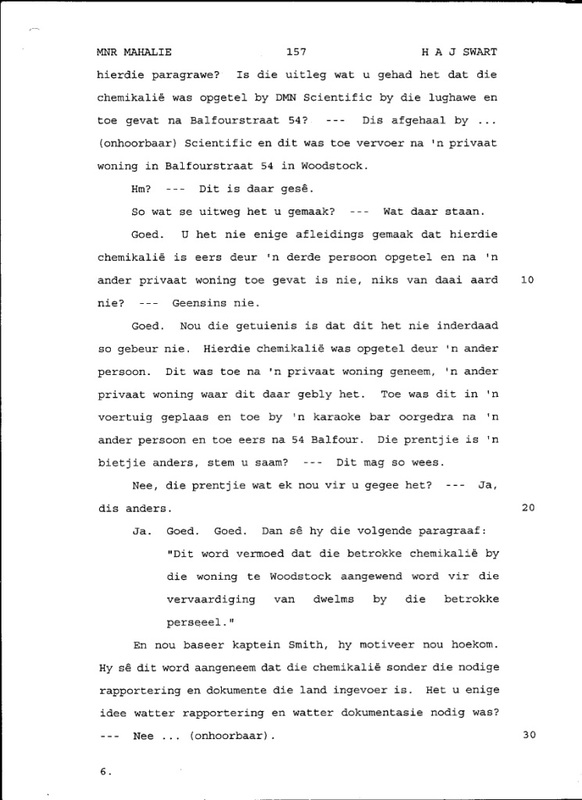 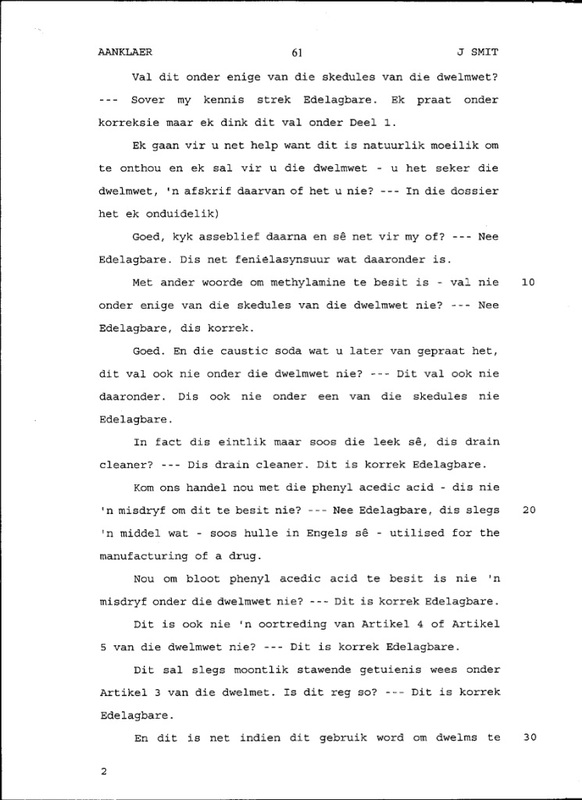 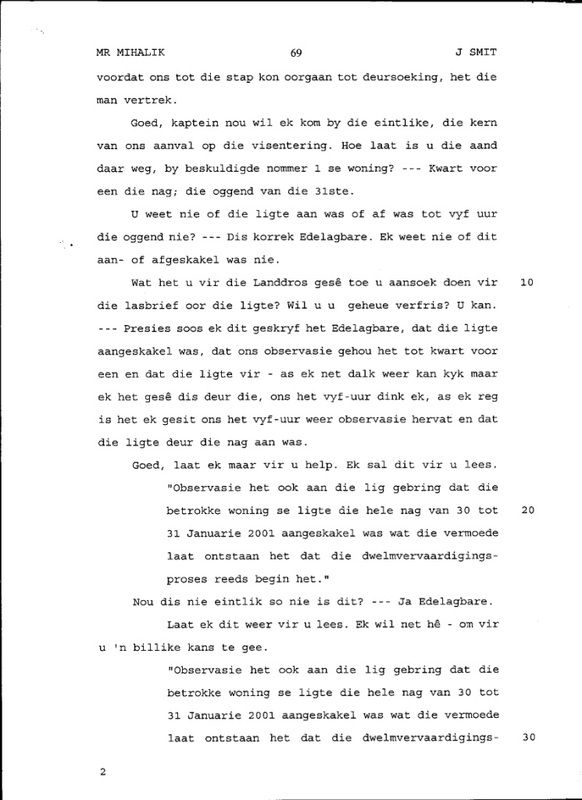 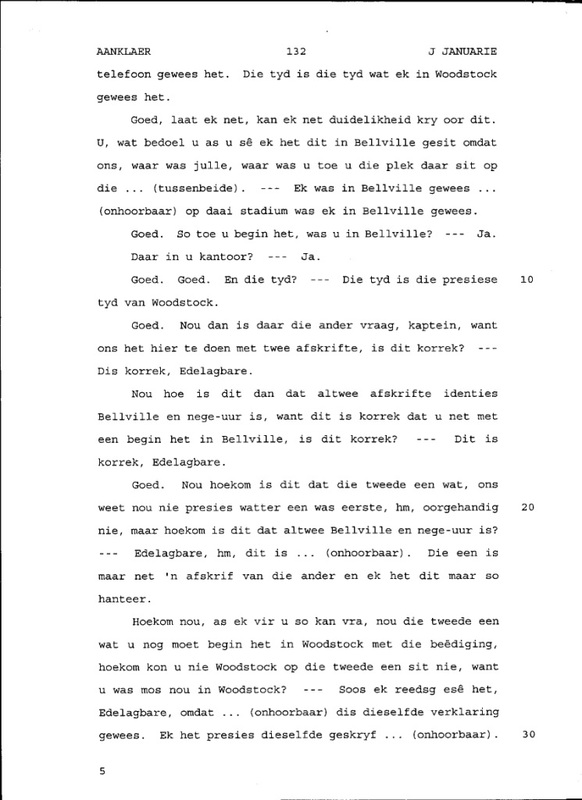 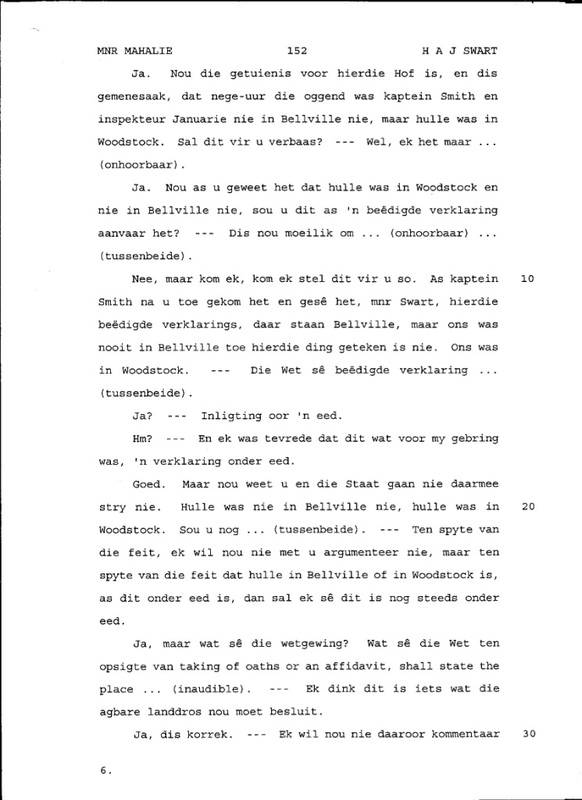 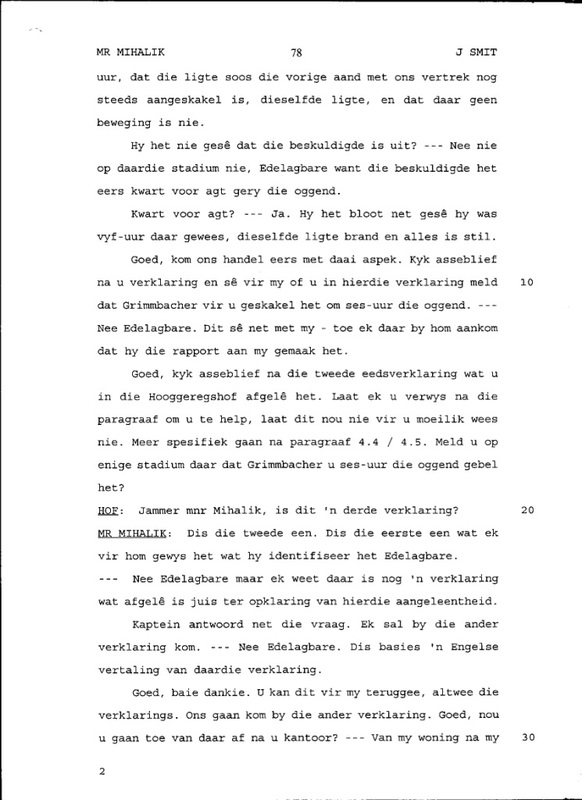 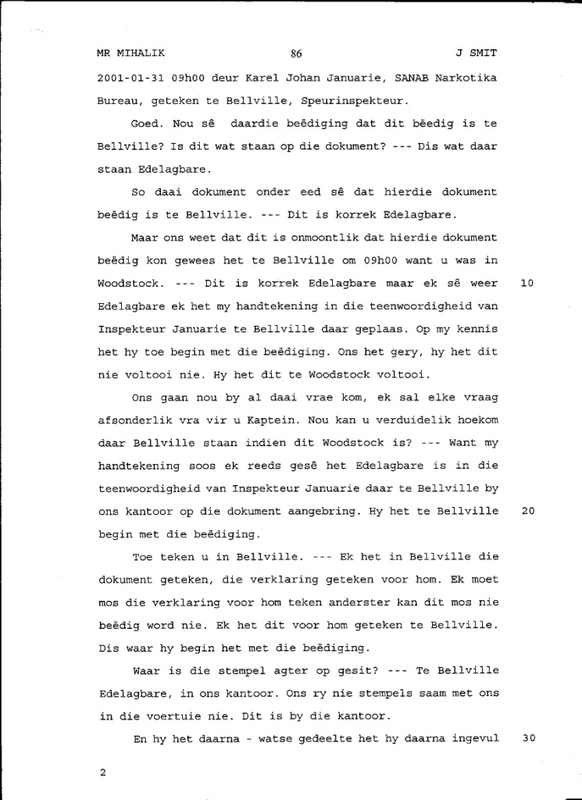 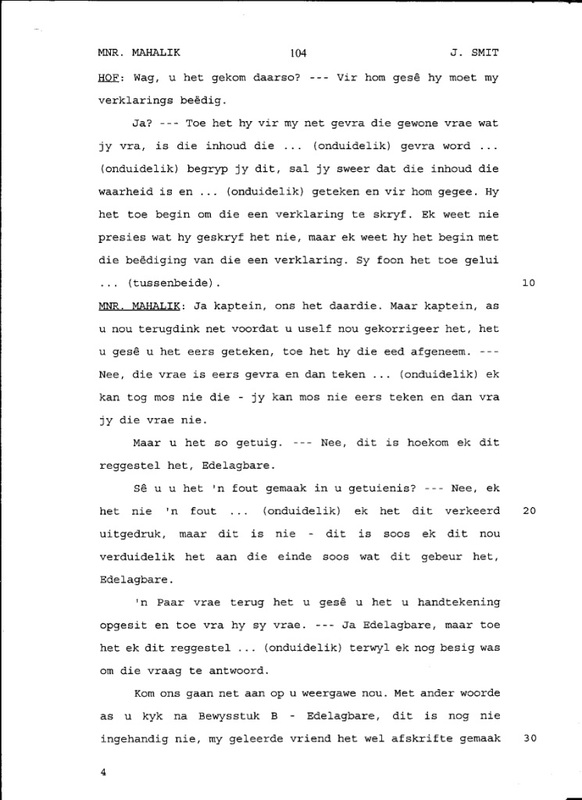 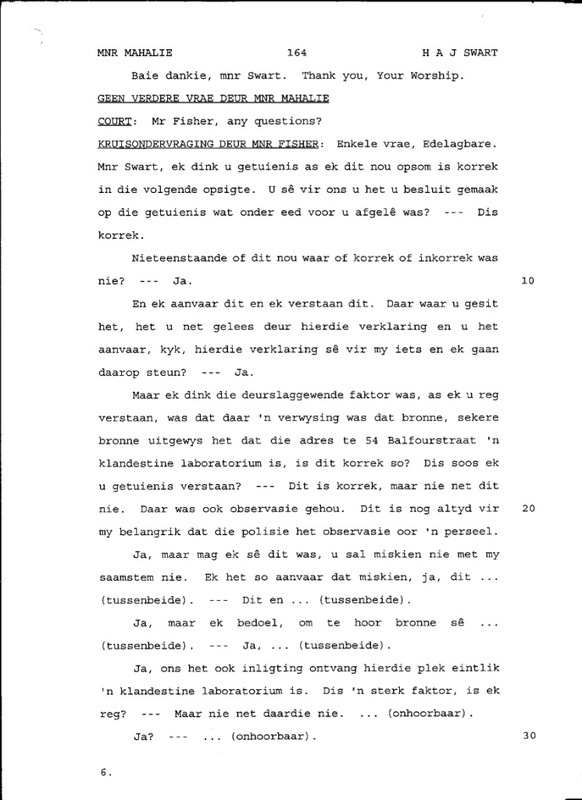 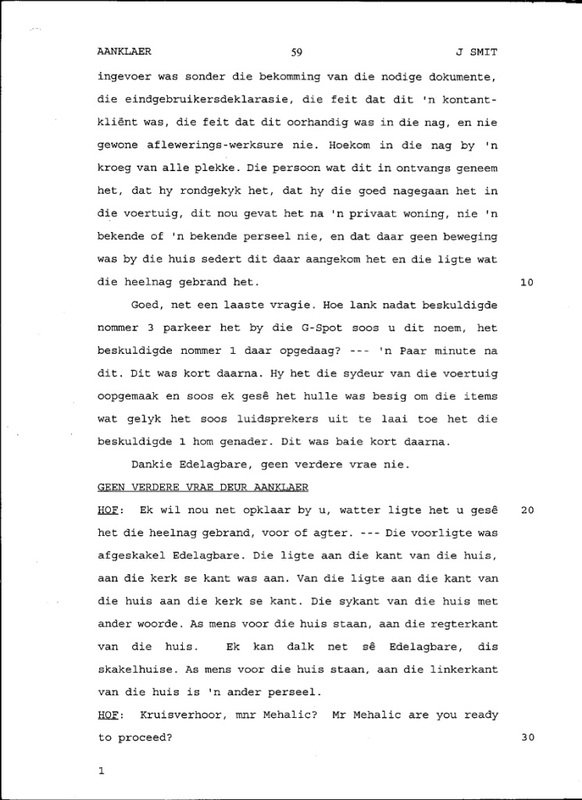 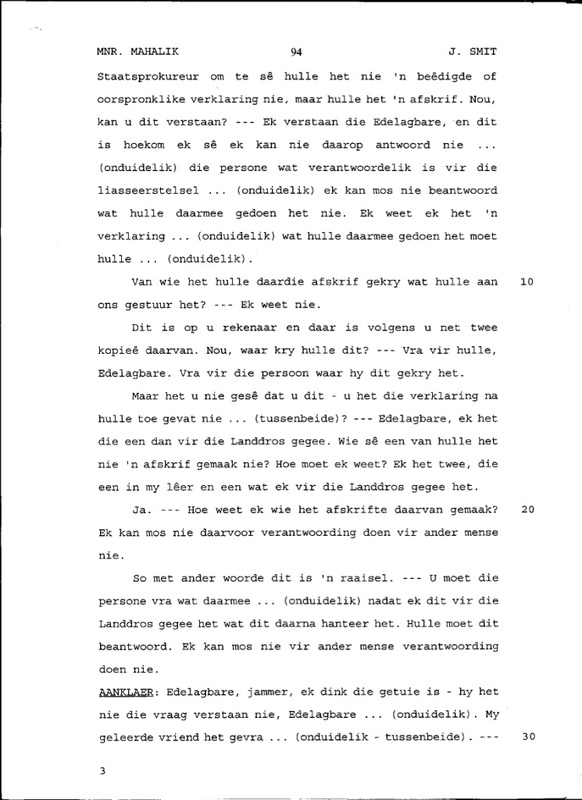 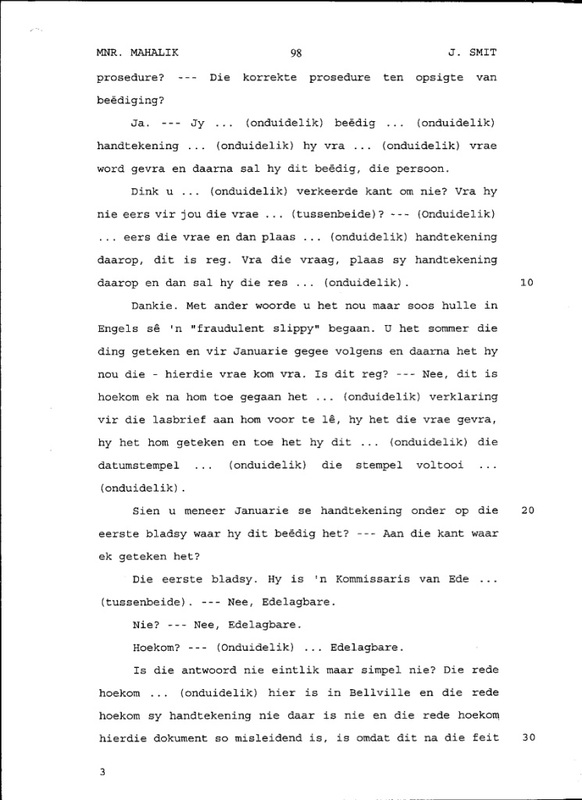 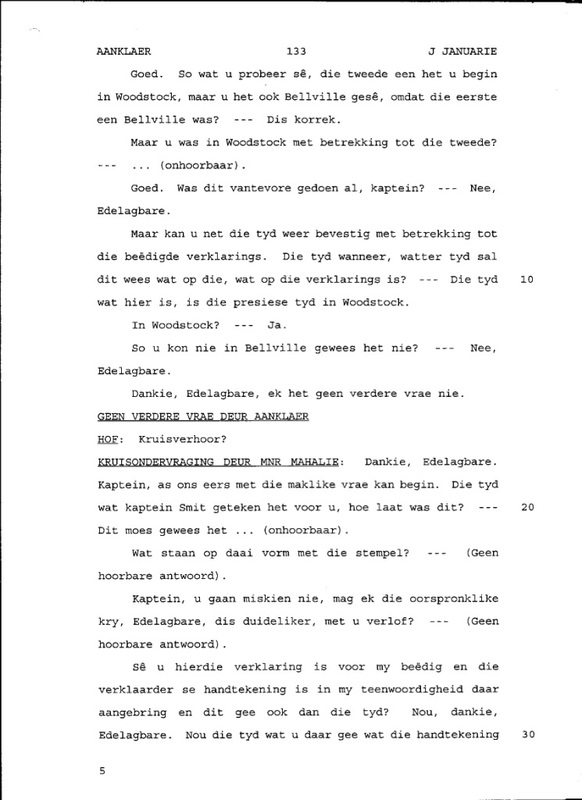 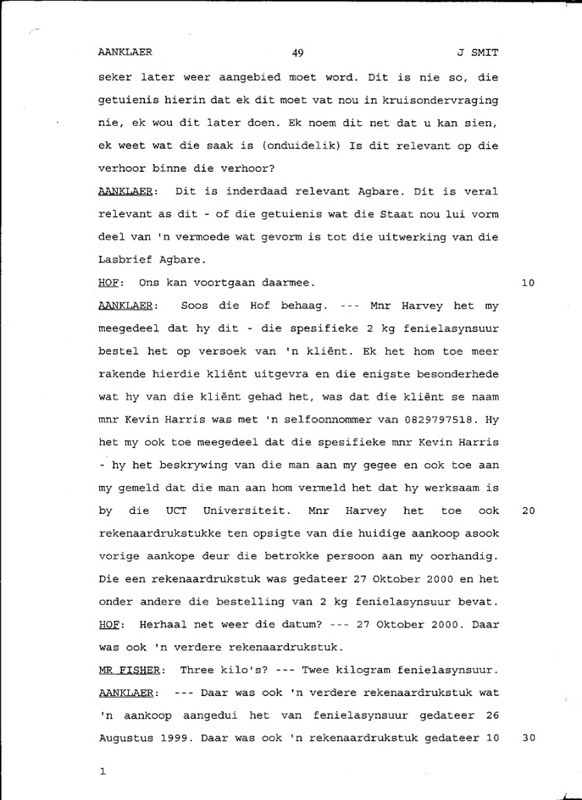 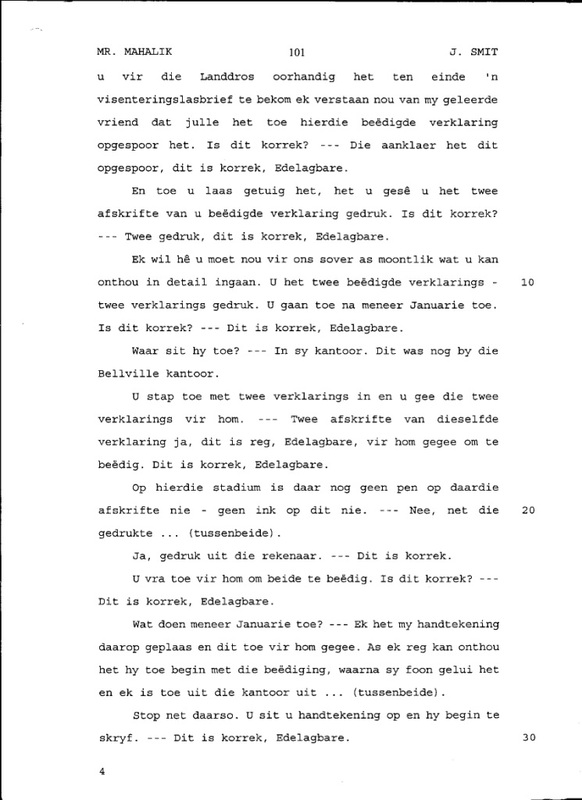 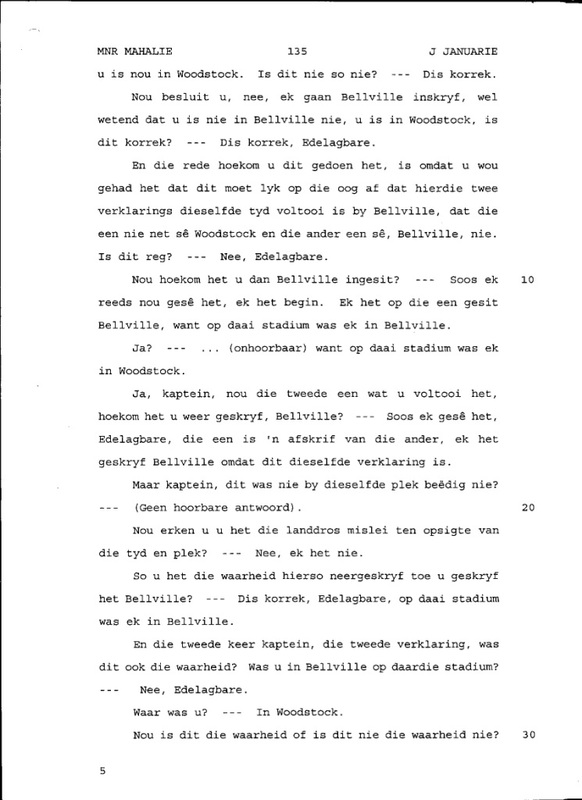 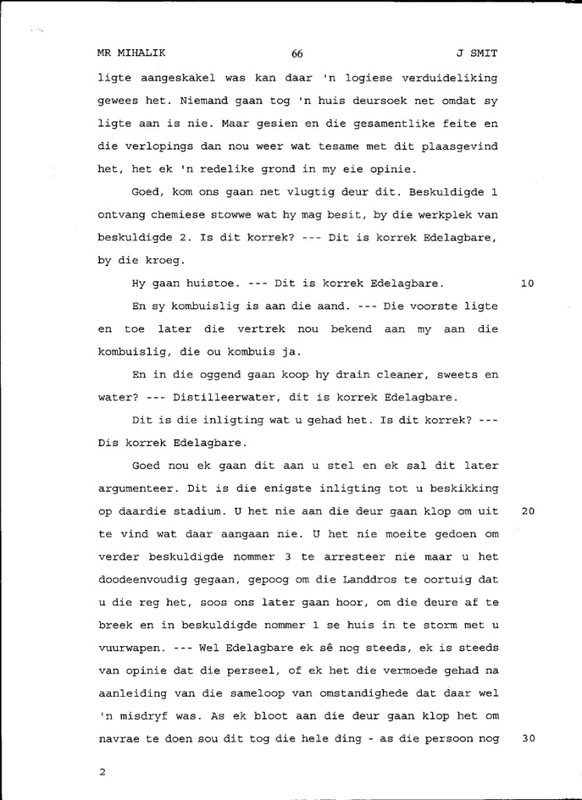 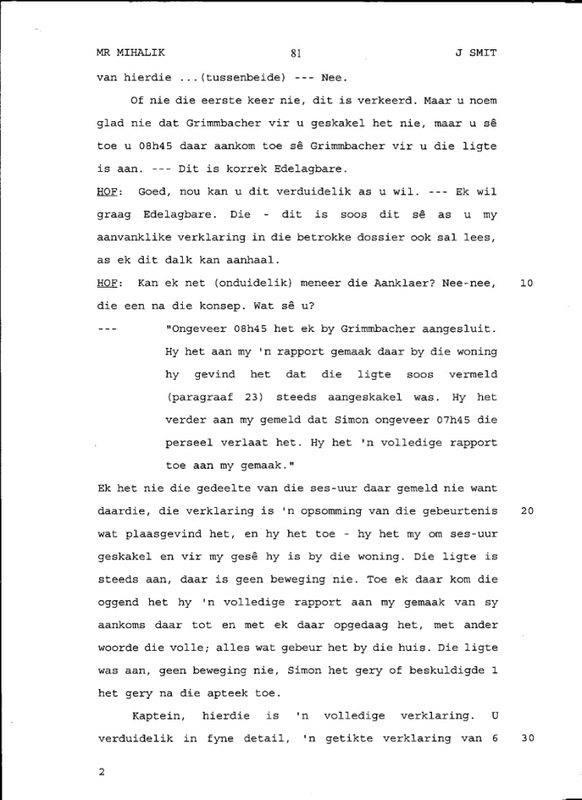 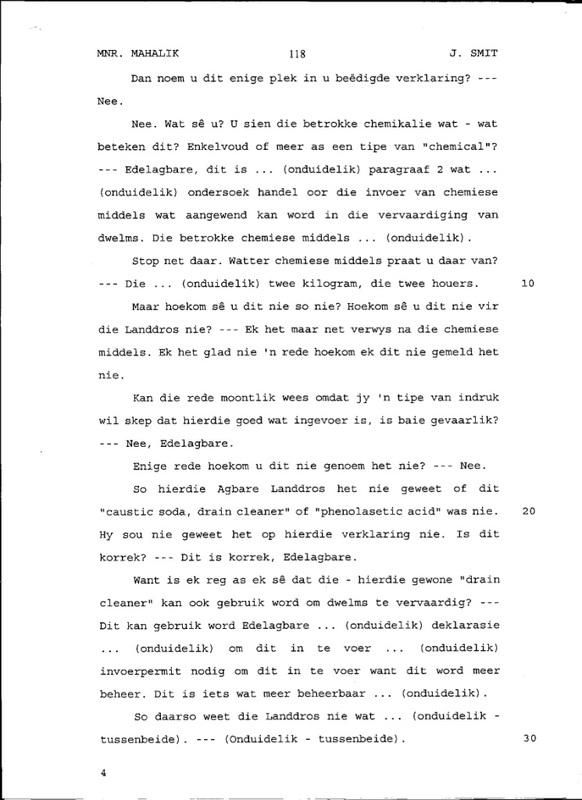 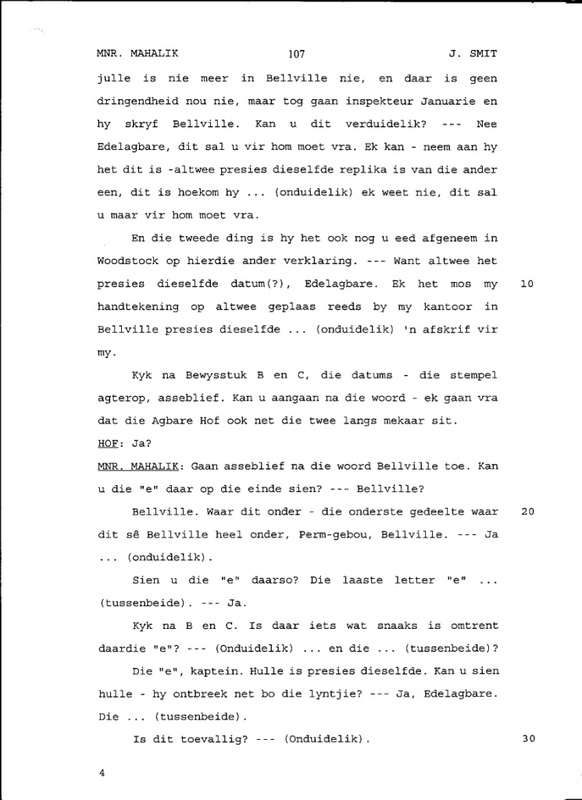 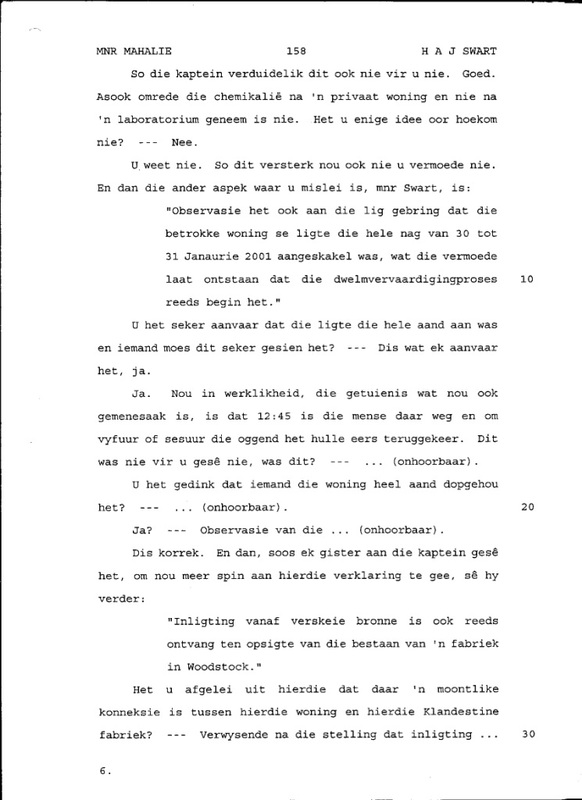 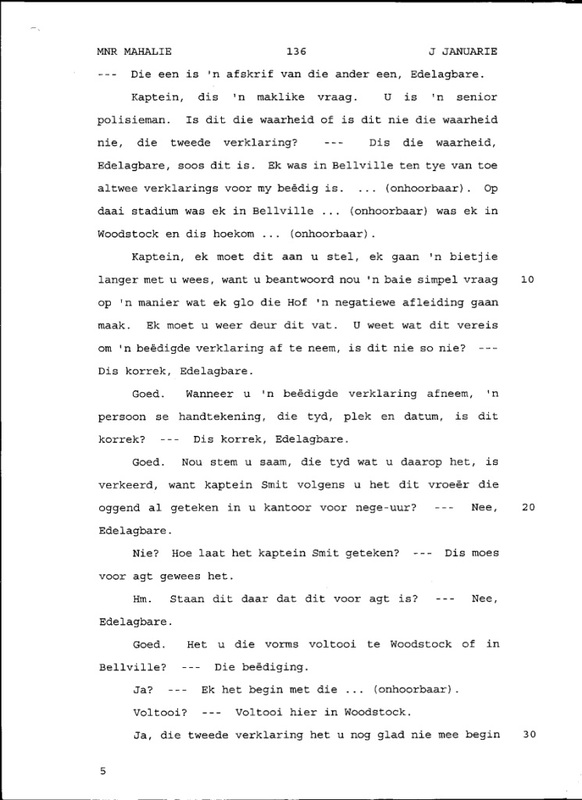 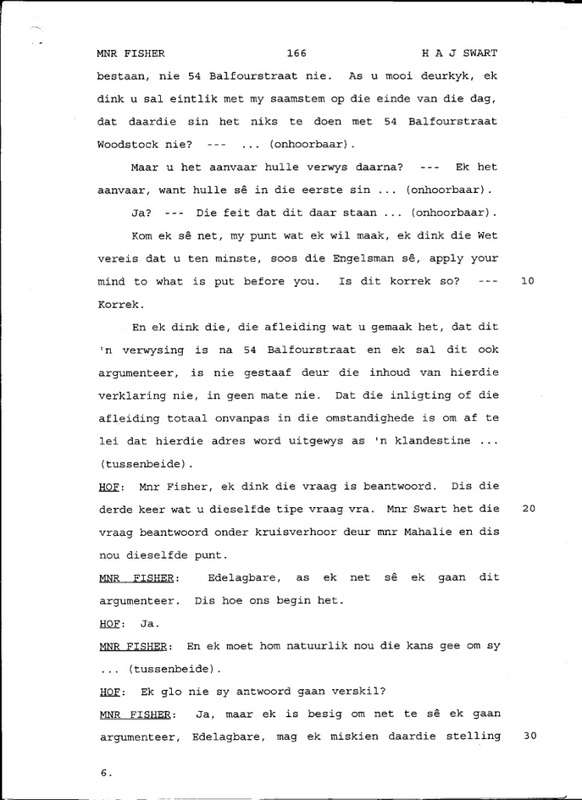 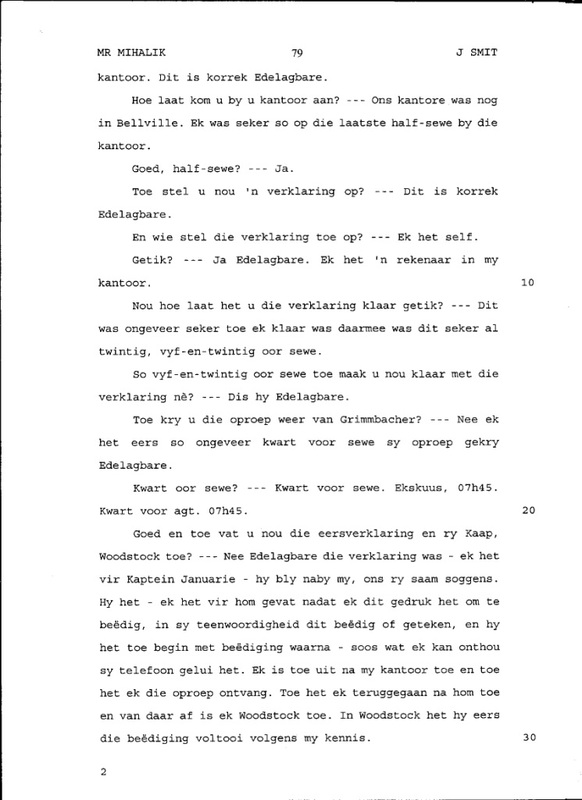 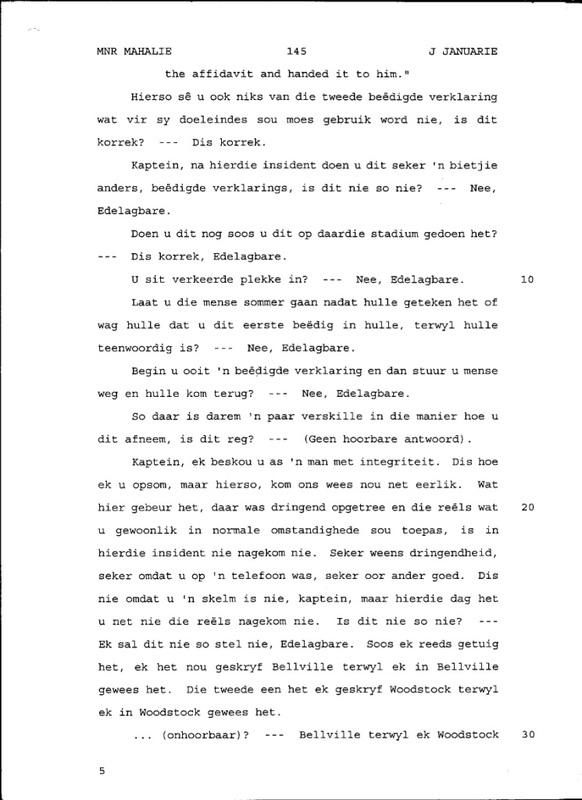 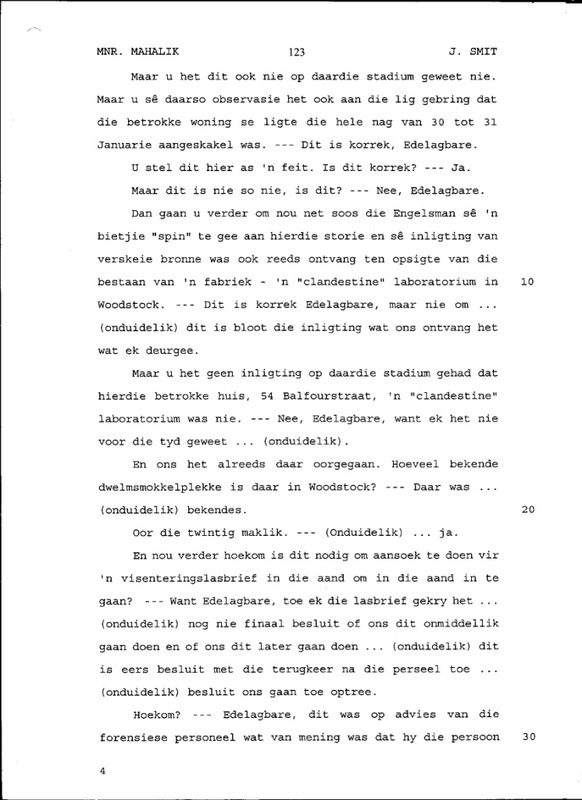 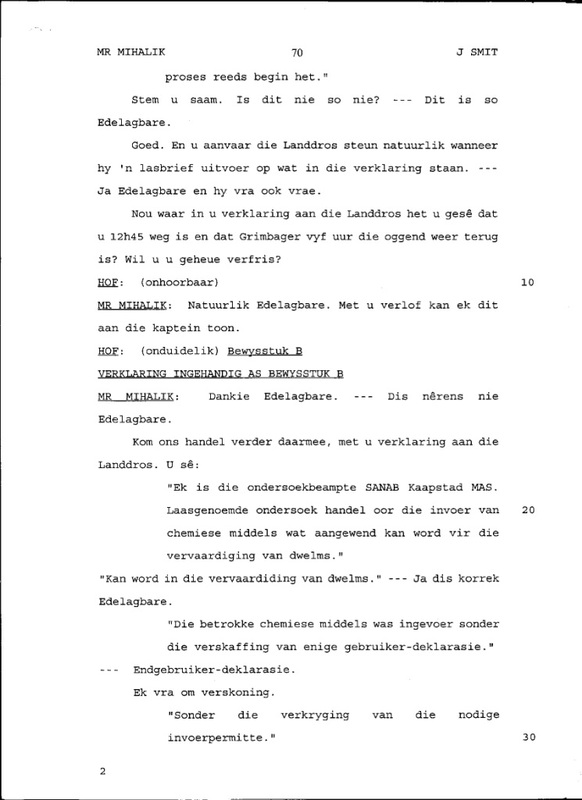 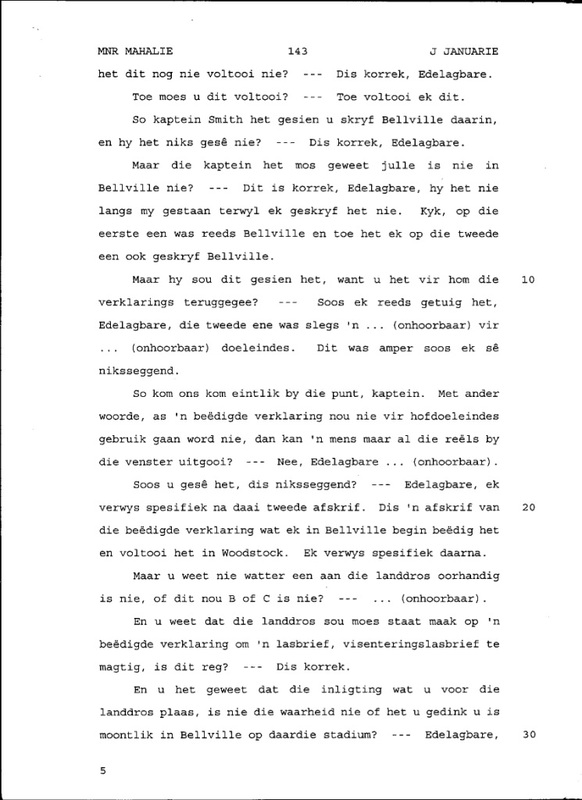 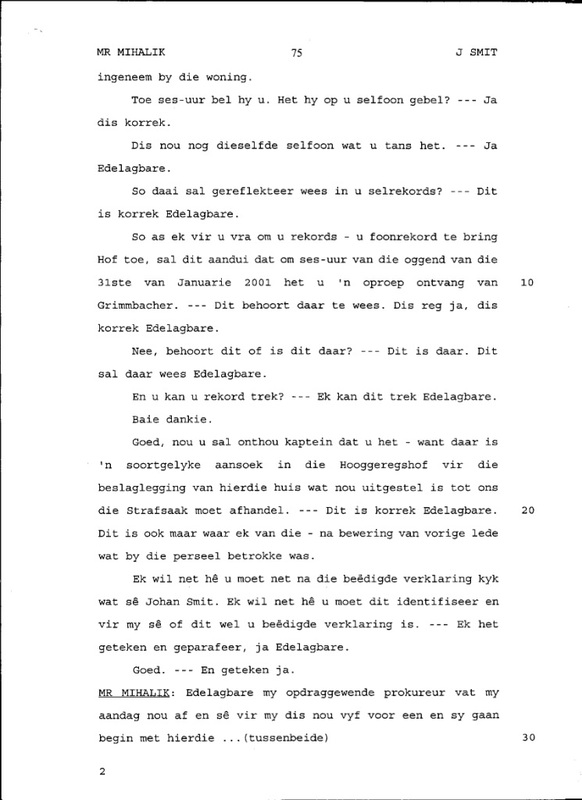 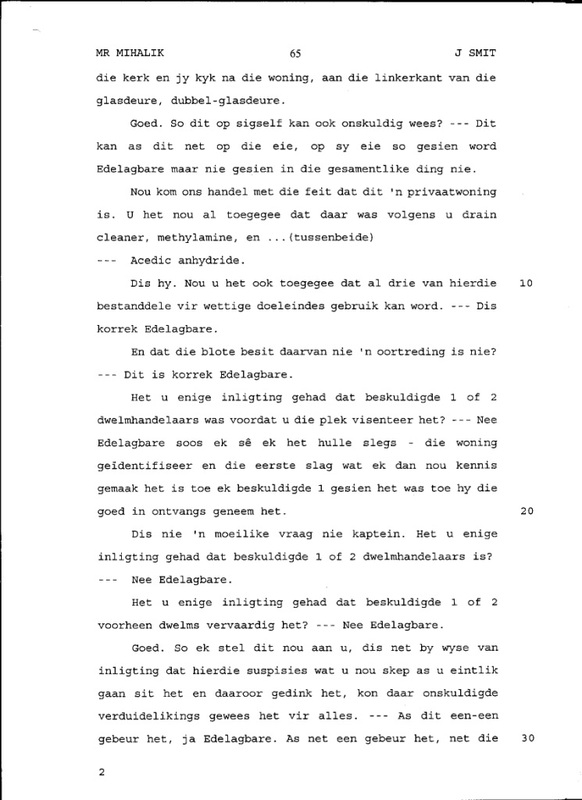 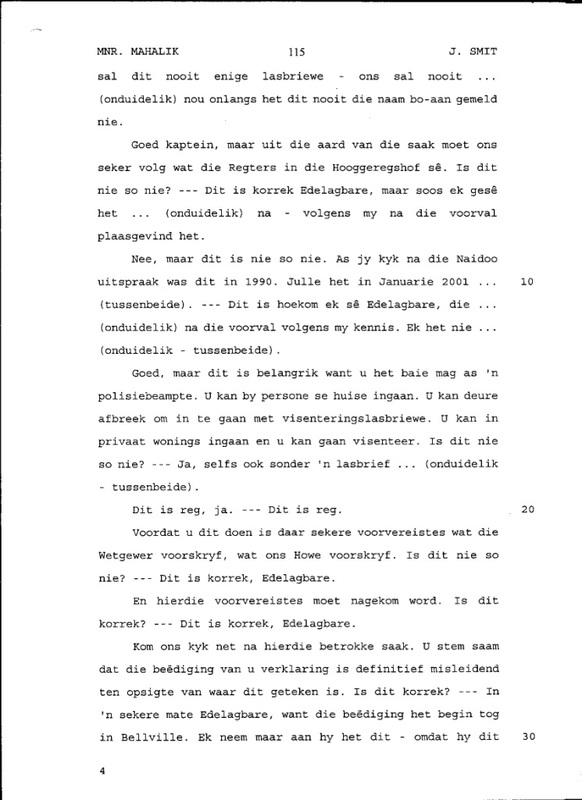 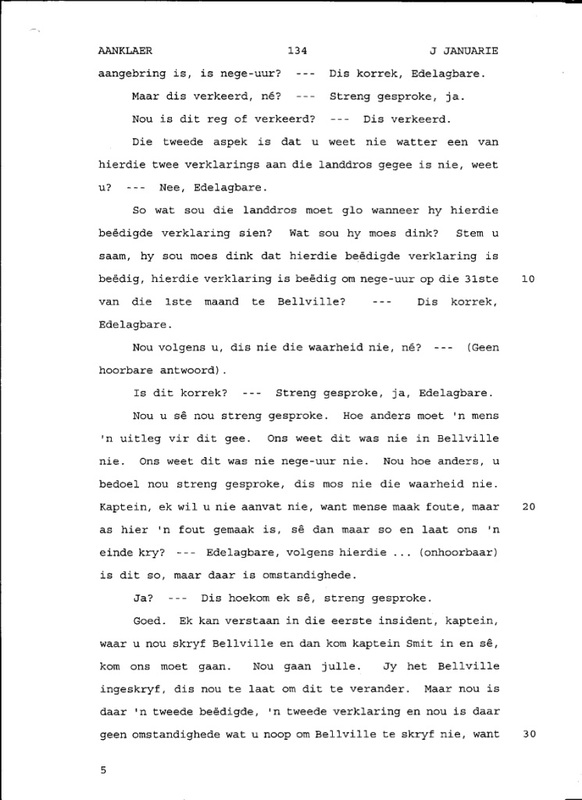 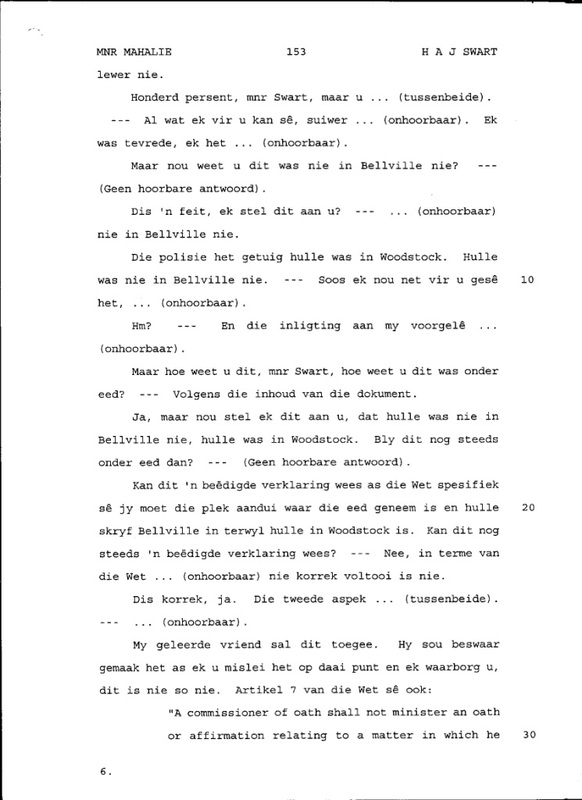 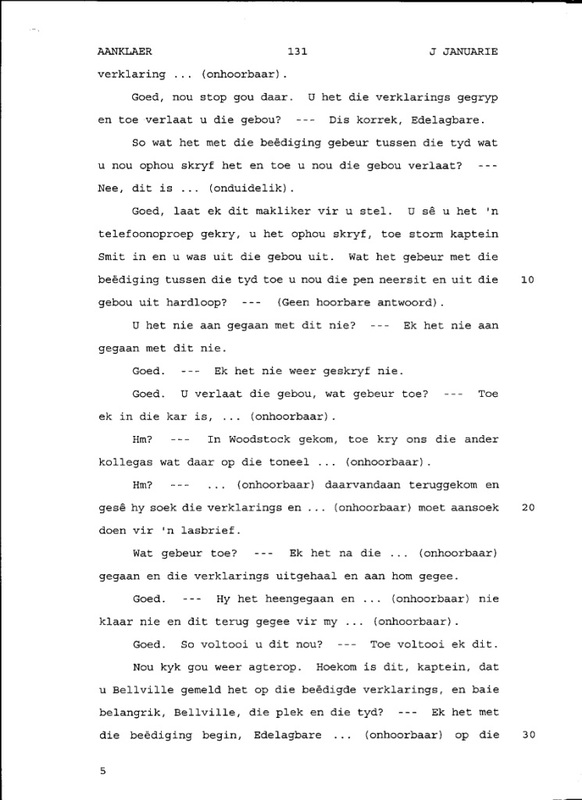 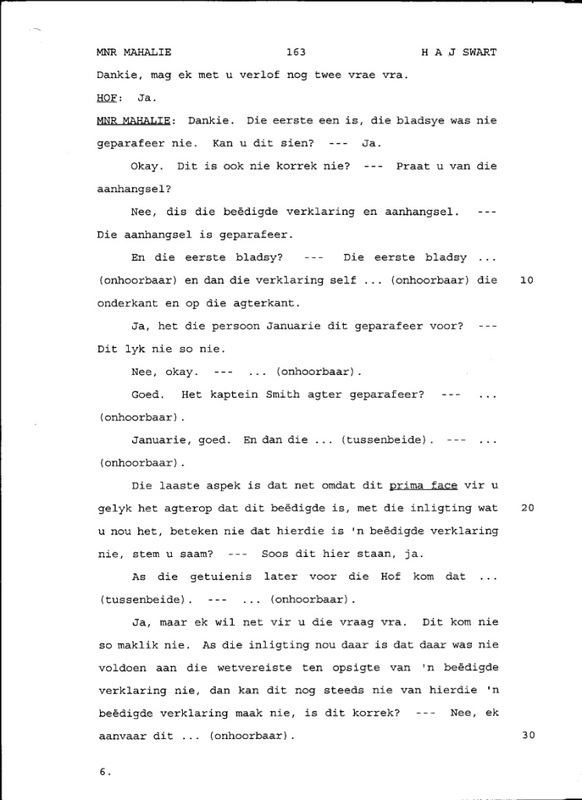 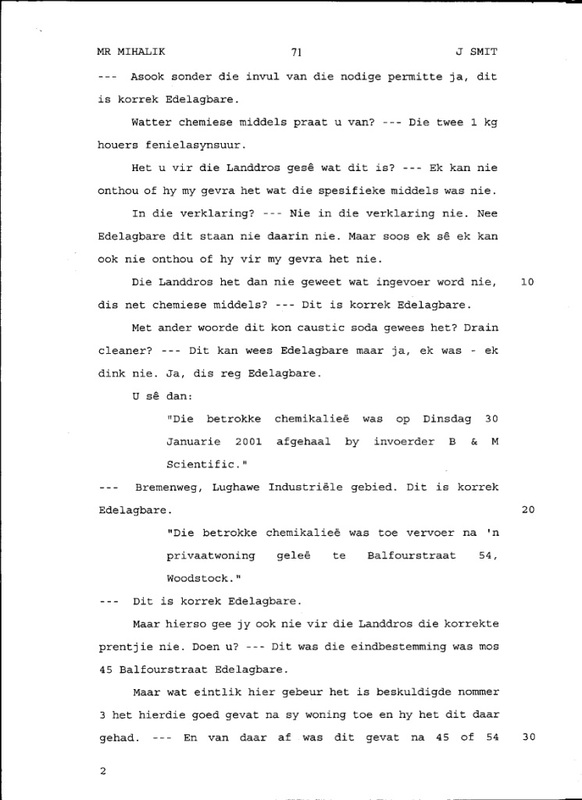 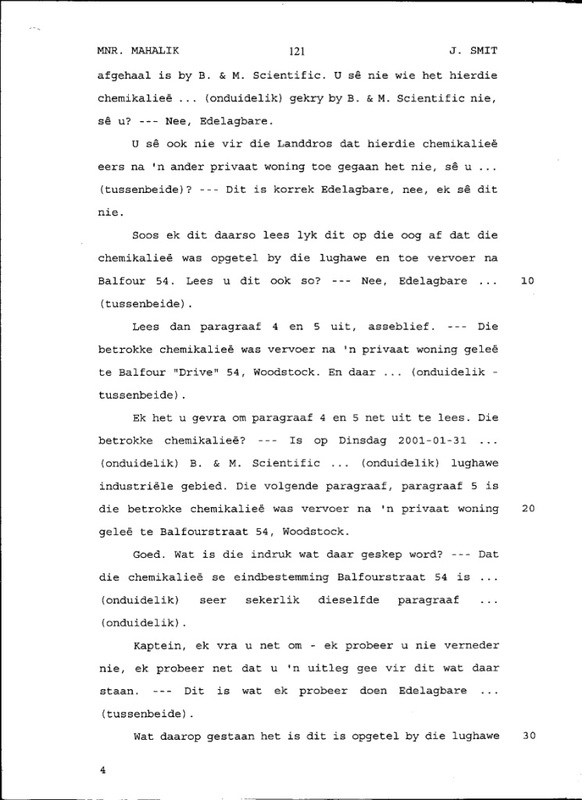 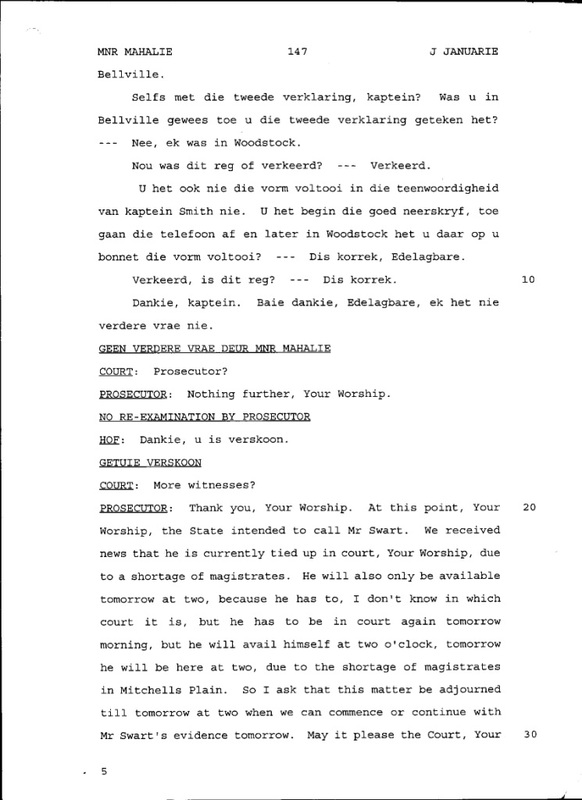 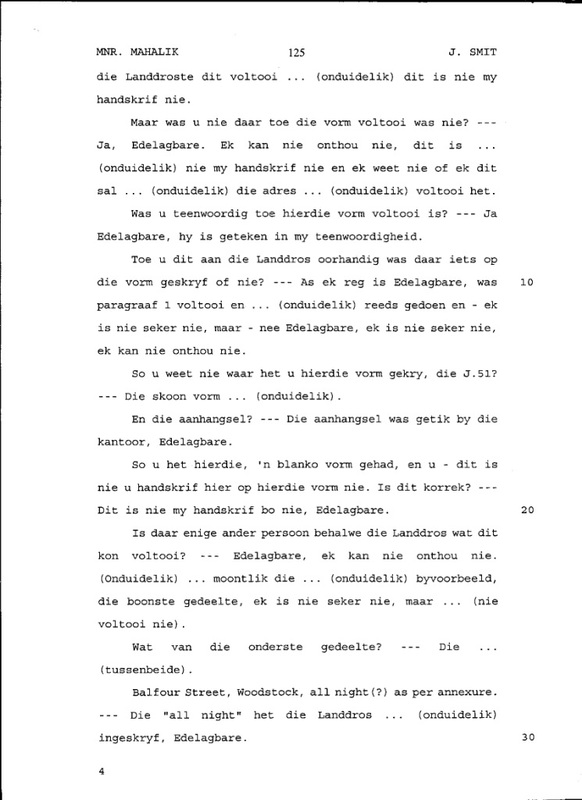 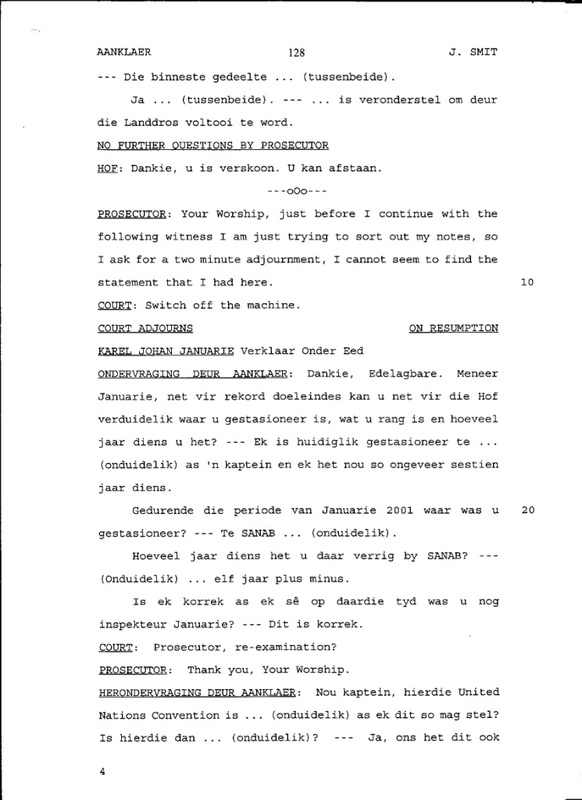 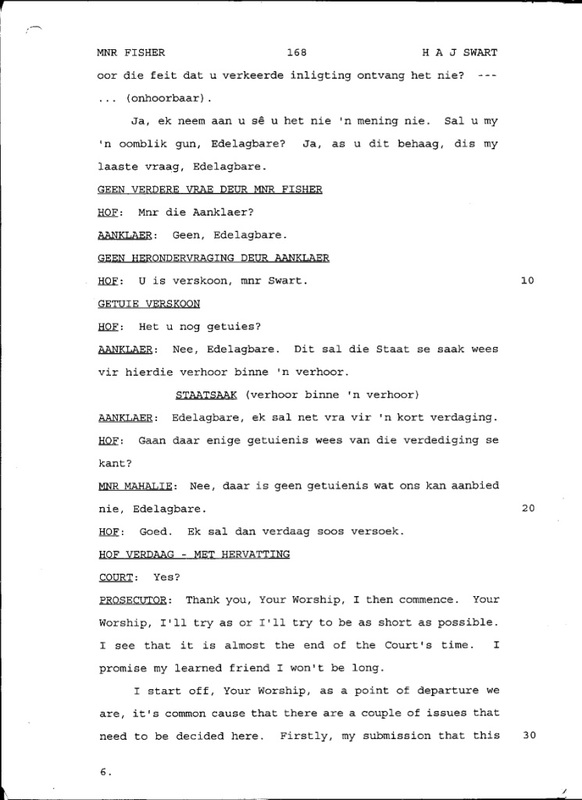 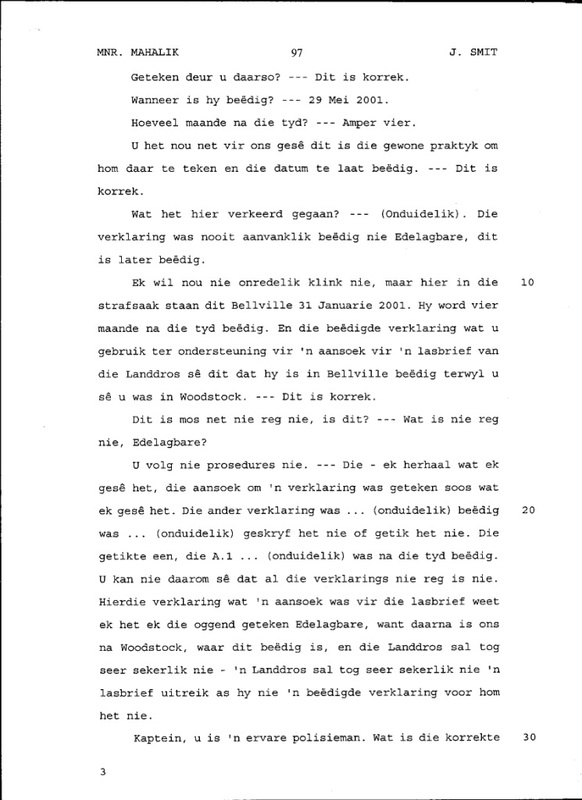 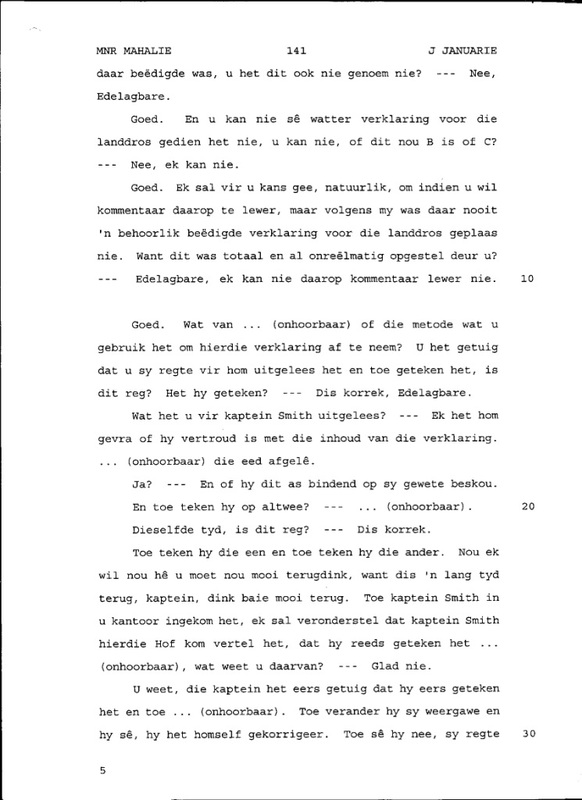 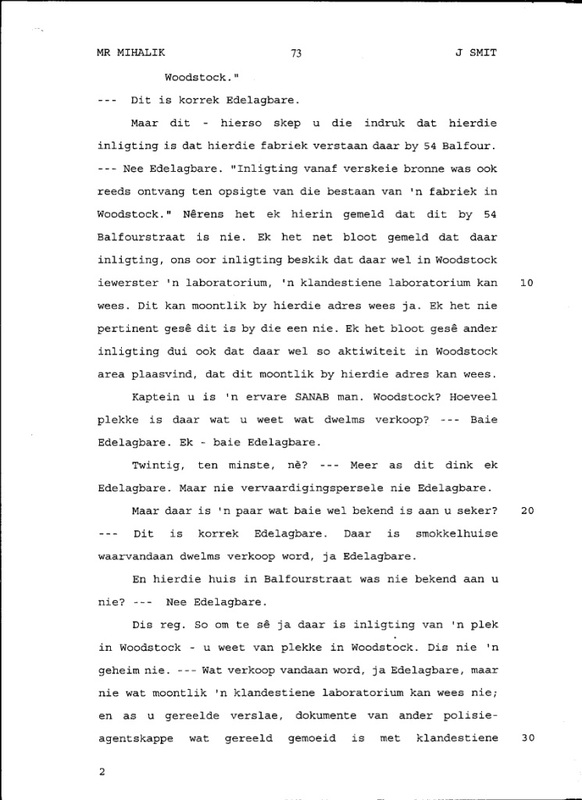 Scroll down to page 147 of the transcripts. 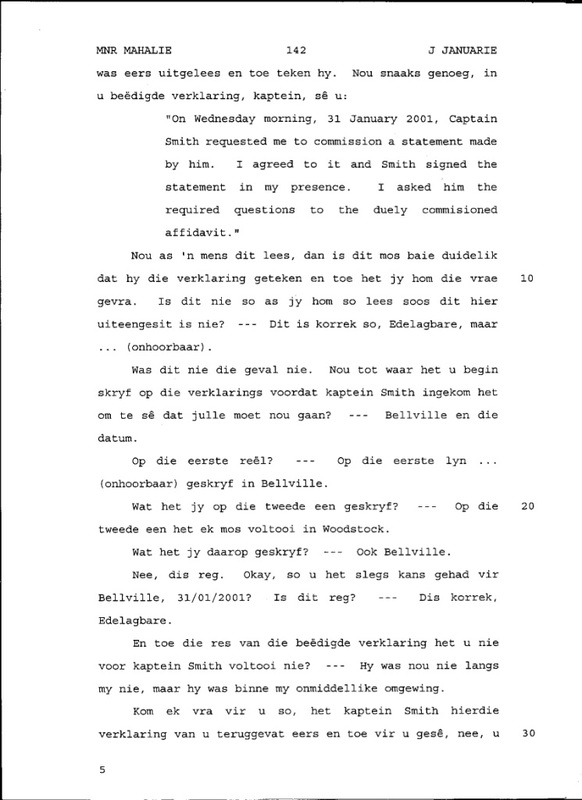 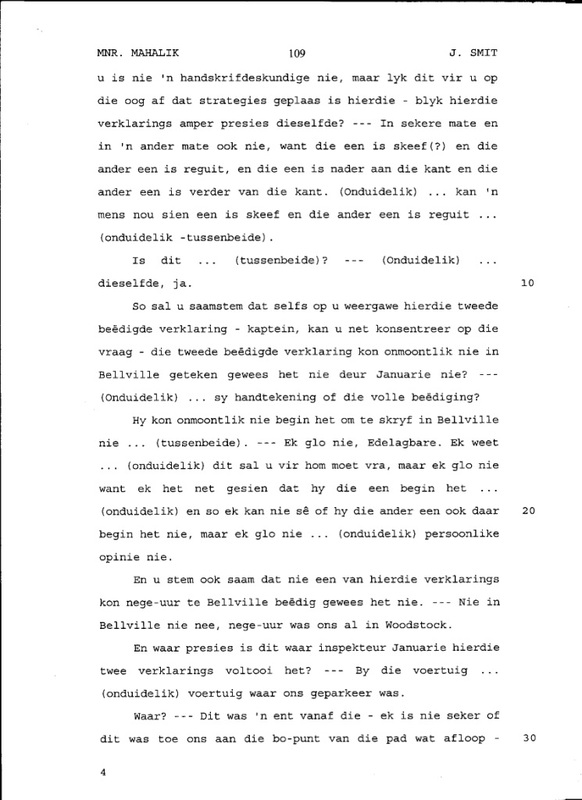 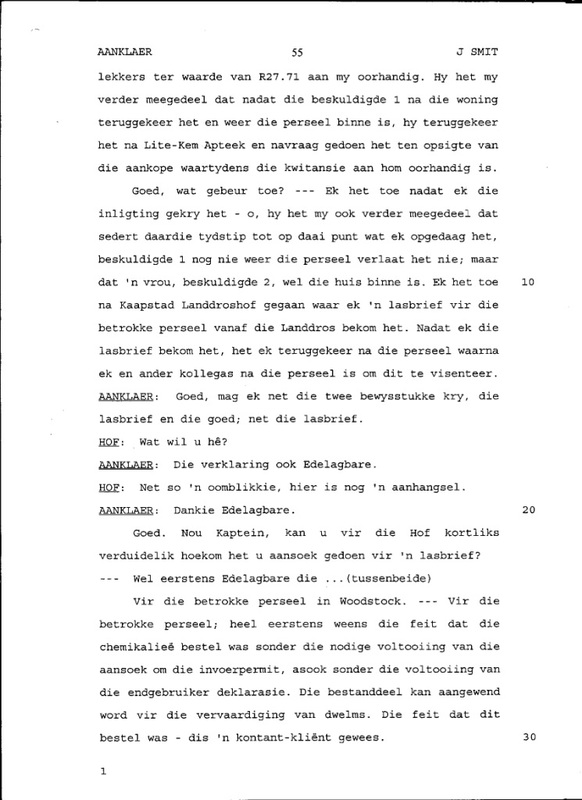 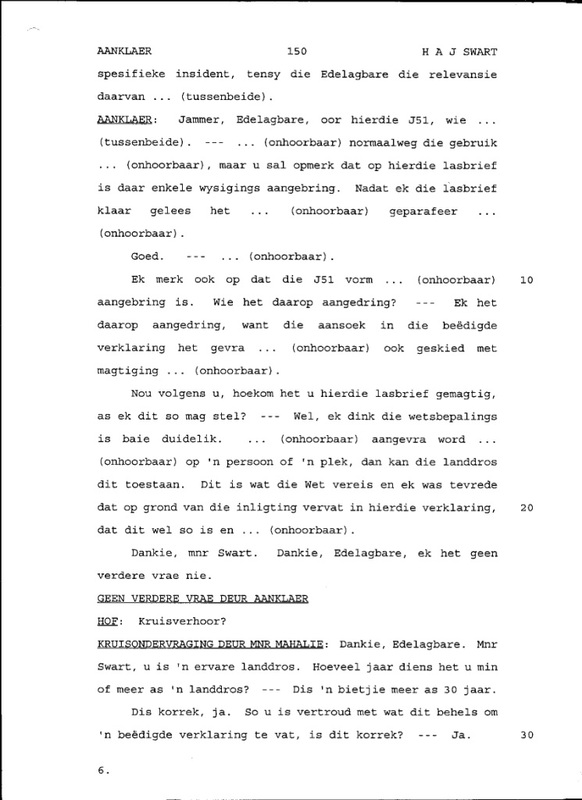 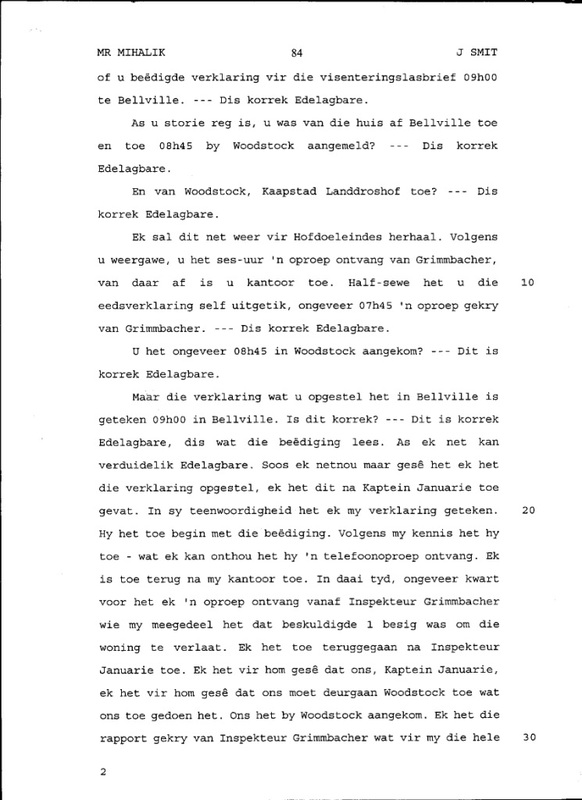 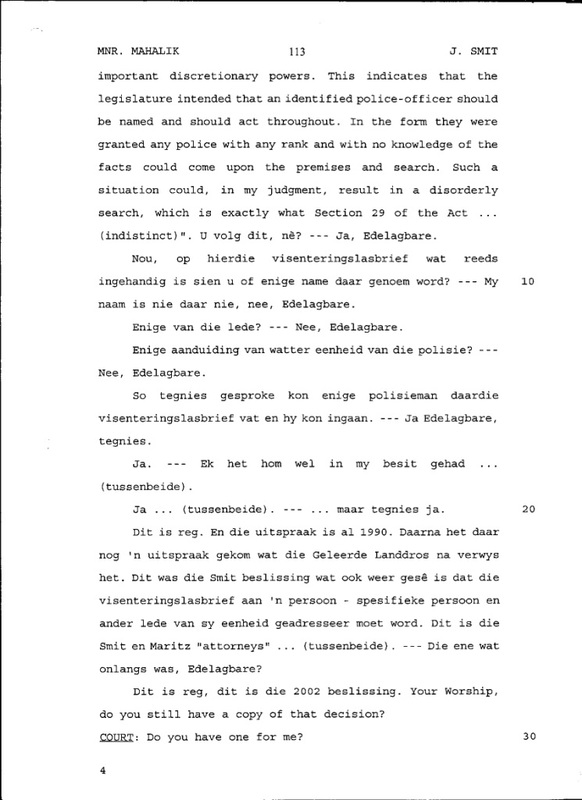 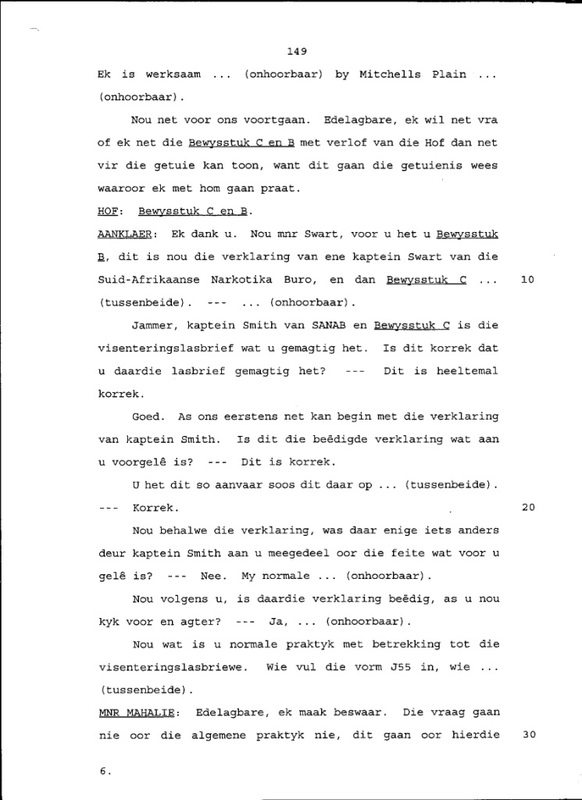 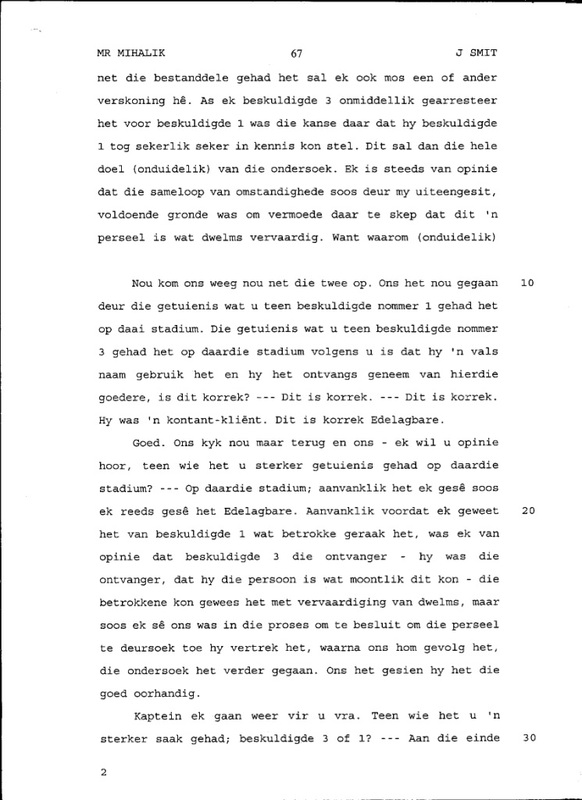 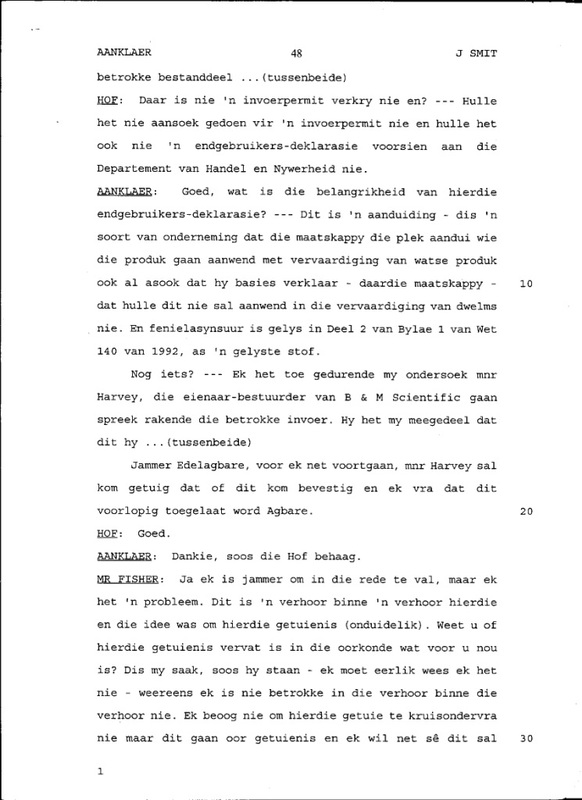 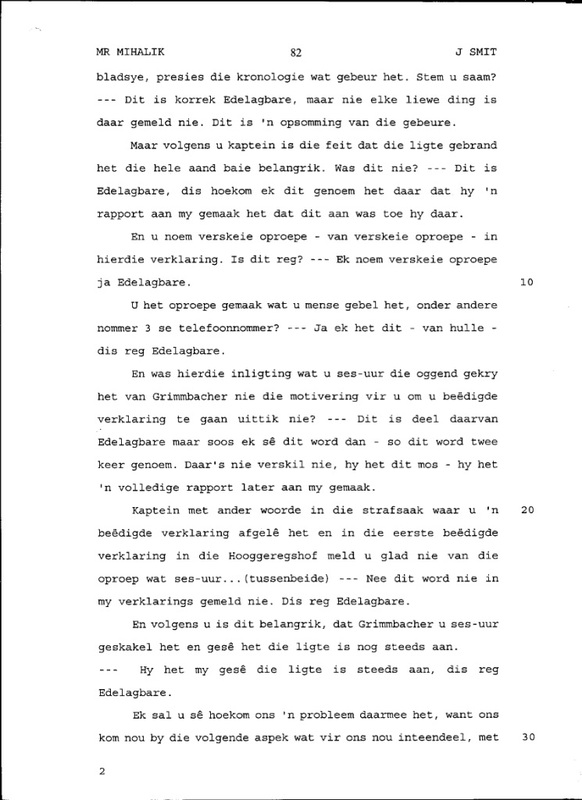 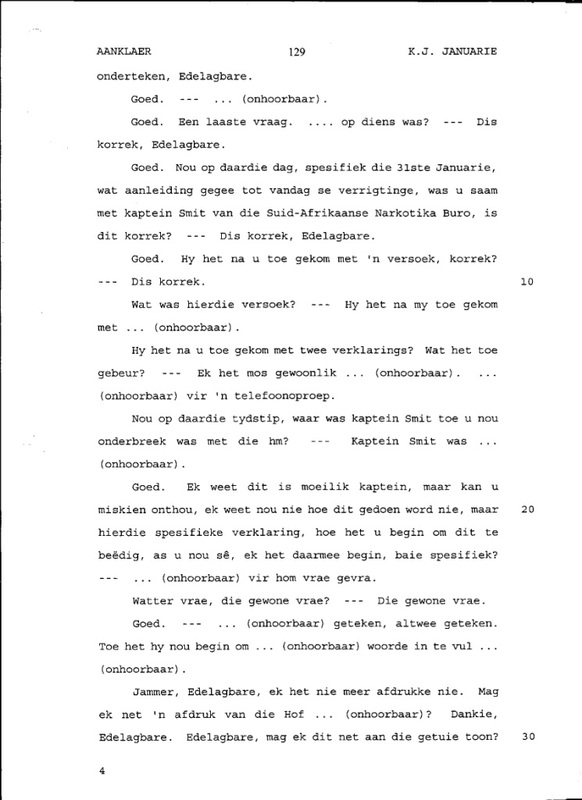 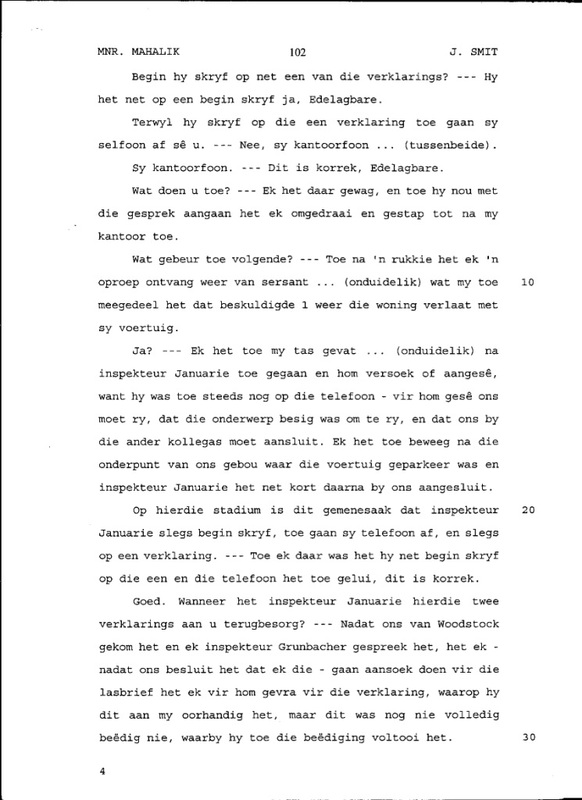 It's not easy to get a policeman to admit in court that he's wrong but the admission of Captain Januarie of the drug police gave Magistrate Matthews no alternative but refer to the drug police conduct as being "reprehensible" and to rule in favor of the accused that the search warrant was invalid. 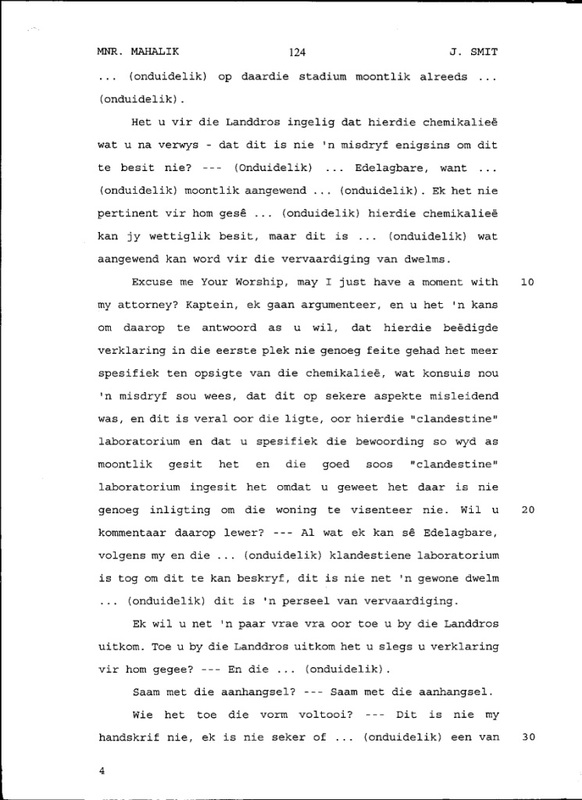 When this trial ended I was made to endure a second criminal trial to cover the same ground covered in this first trial. 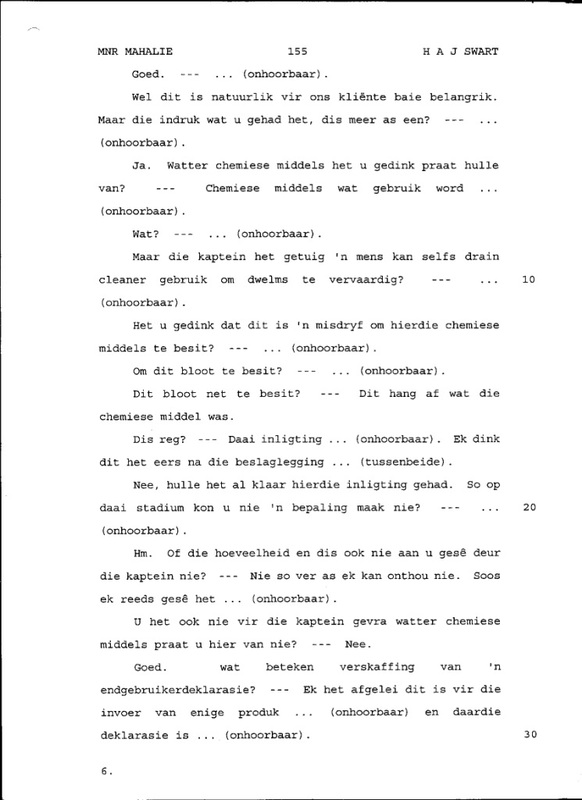 I'm the one who paid two different legal teams to defend myself in two different criminal trials from the same arrest and the same charge so don't anyone try to tell me this is not double jeopardy. 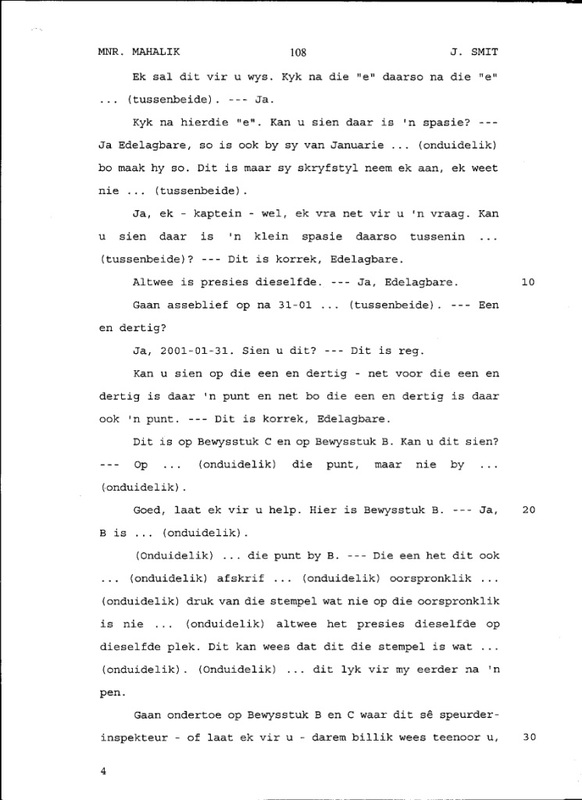 Section 35(3)(m) of the Constitution expressly forbids for this to happen to an accused person yet in spite of the Constitution this did happen to me and this is bad but things compound and get worse when we witness the state instituting another case which is a criminal allegation disguised under an umbrella of what is called a civil case against me stemming from the same criminal charge in the midst of the two criminal trials. 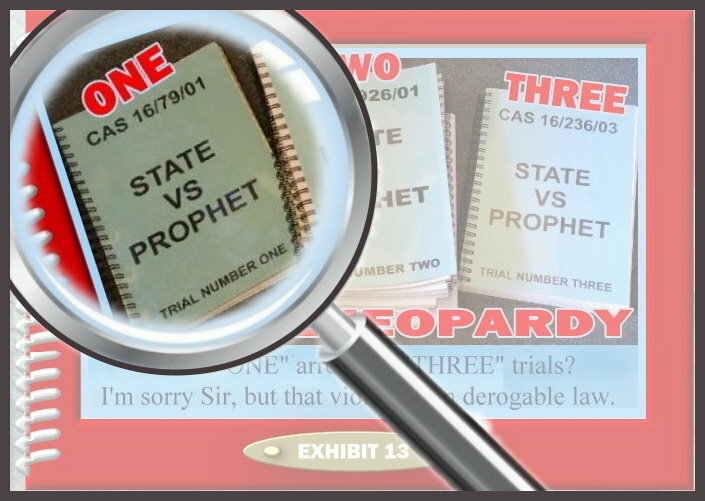 Obviously these three trials put the state's actions against me into the bracket of what is illegal. 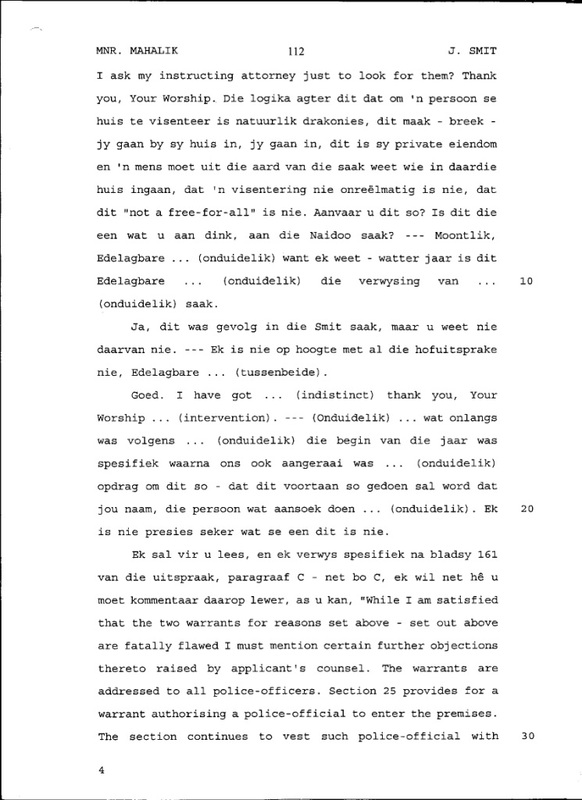 What sinister motivation lies behind any judge or any advocate working for the state who does not recognize such blatant unlawfulness. 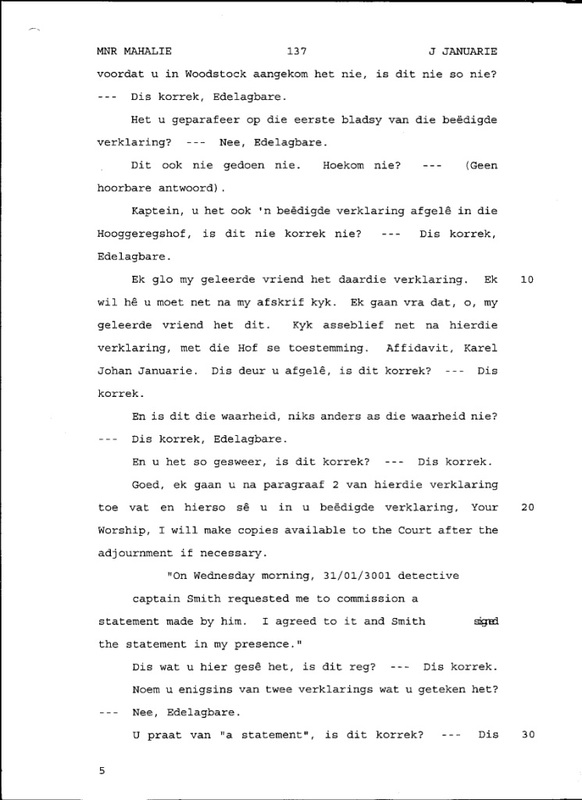 To publicly label me as a criminal does not entitle any judge to ignore these civil right violations. 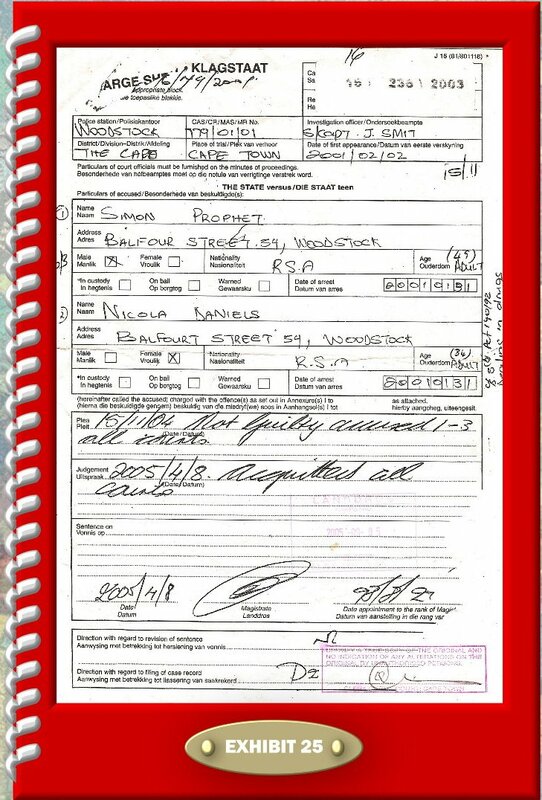 Since no crime has been recorded against me then for state advocates or civil court judges to be saying in public that I am a criminal only adds fire to my charge against those who have flagrantly been violating the Constitution and my civil rights. 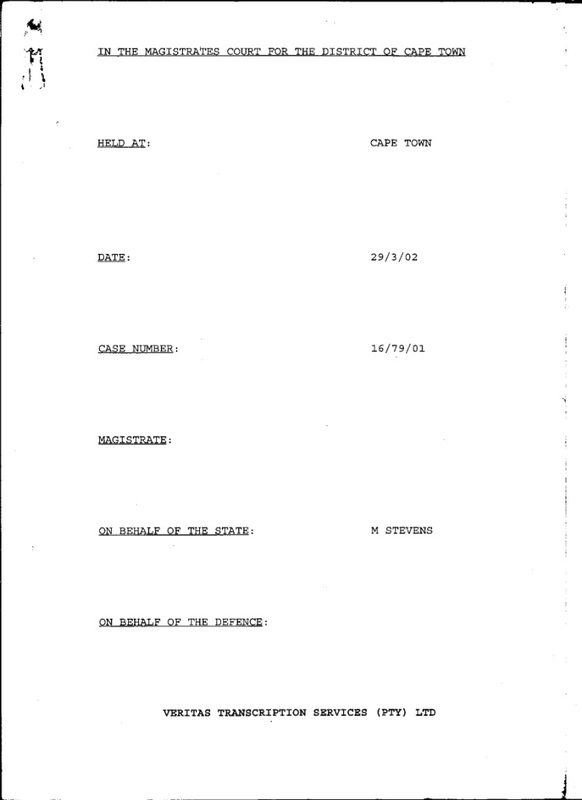 I have done nothing wrong but the civil courts have punished me for being a criminal. 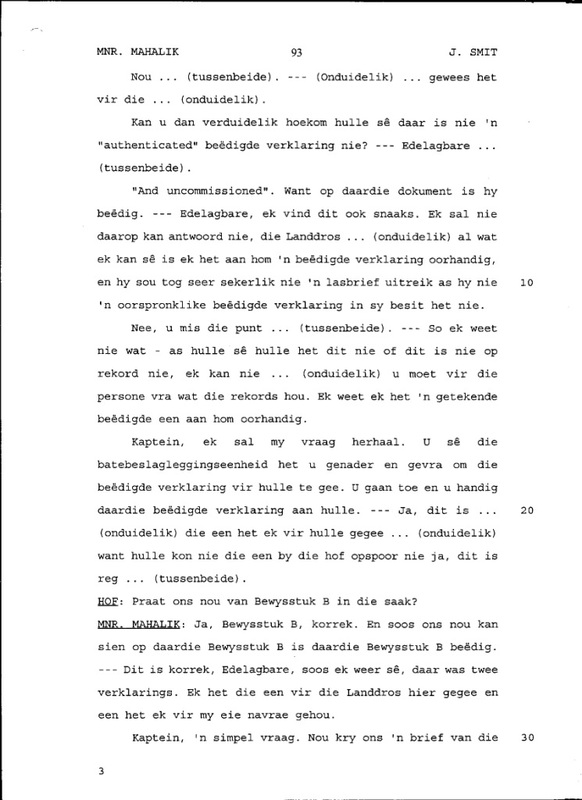 I was charged for being a drug dealer but I was acquitted of that charge but that did not stop the state, under the disguise of fighting crime, from taking my dignity, my land, my home, my business, my cars, my possessions and kicking me into the street with nowhere to go. 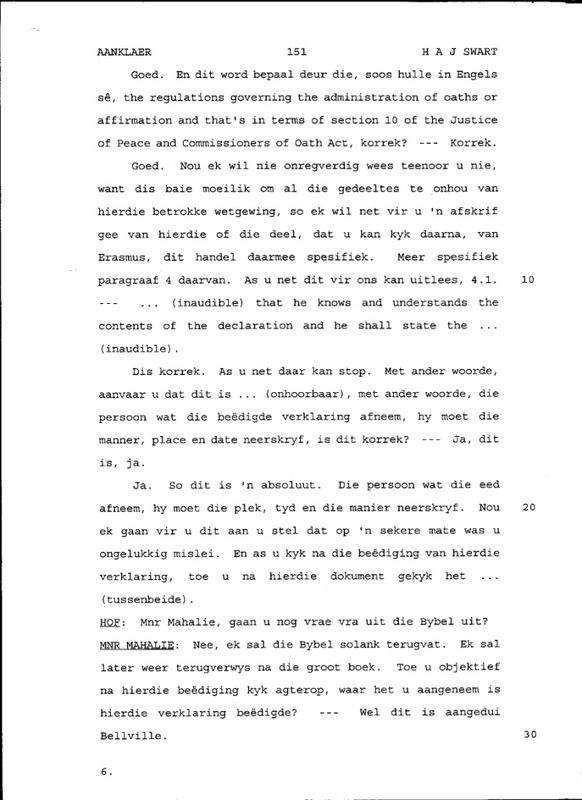 The presumption of innocence is a non derogable law and even in a state of emergency no leverage exists that allows any judge or any panel of judges to override these supreme laws. 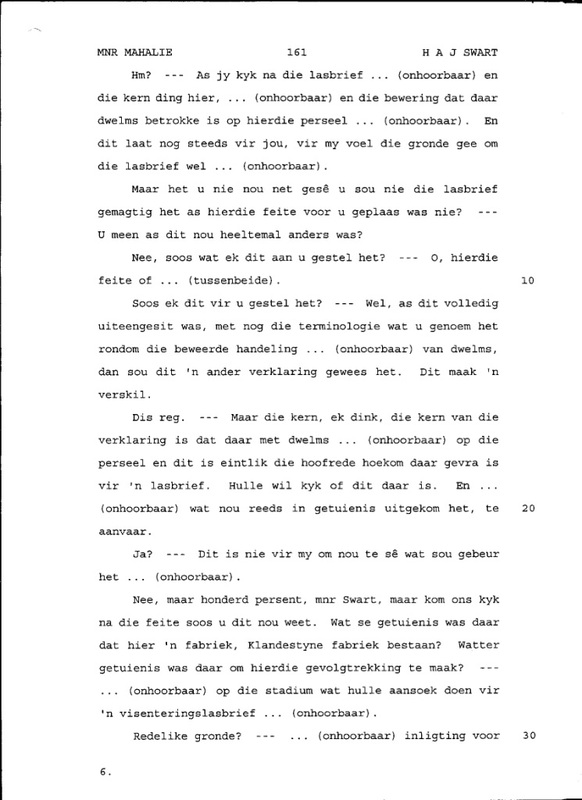 So now ask the question: How was it possible for the state to have punished me? 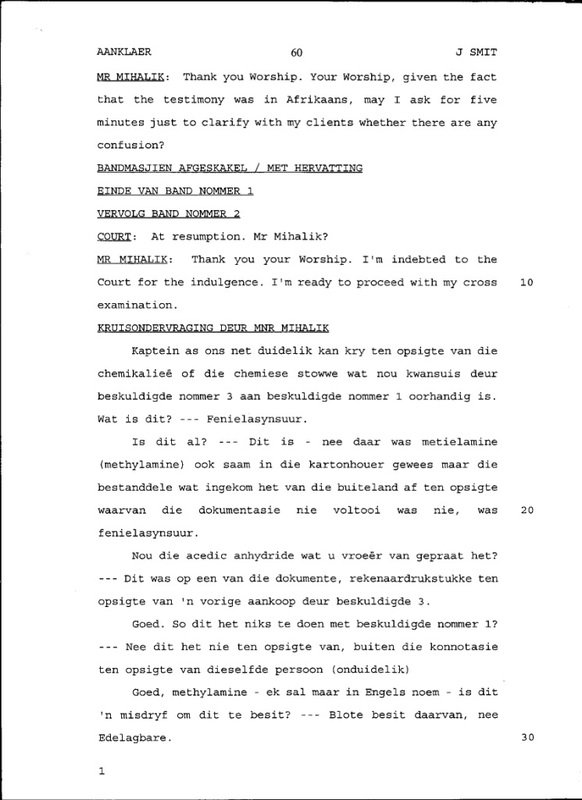 Look at the facts that I am presenting and in a moment anyone can see, it's obvious, you don't need to be a lawyer to know that there is something gravely wrong with this picture? 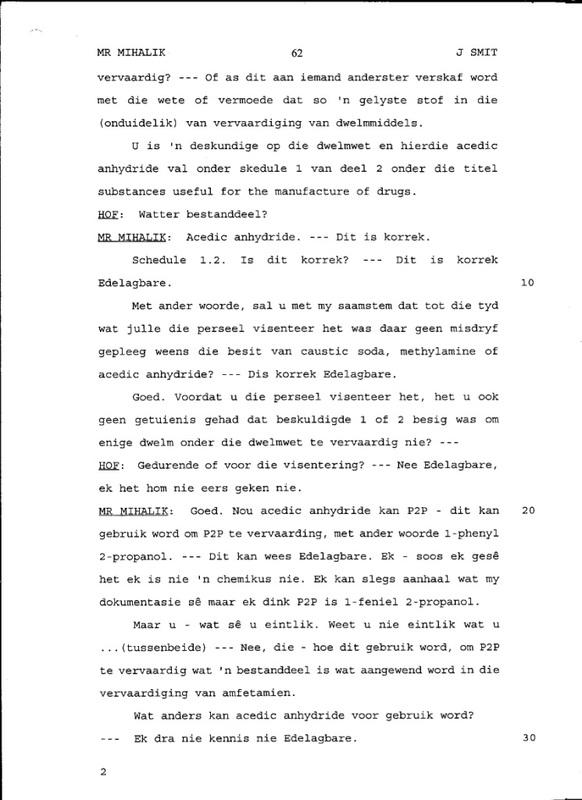 No drug related complaint has ever been brought against me from anyone in the general population. 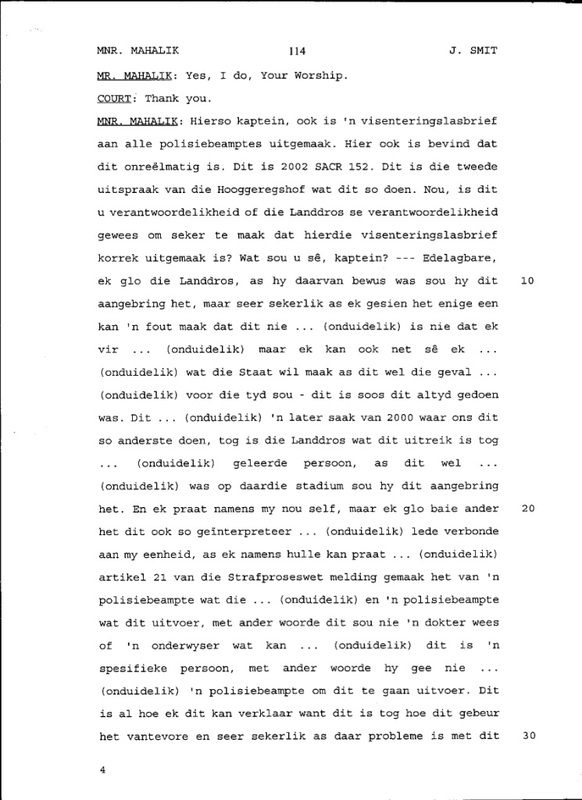 It is only the state and the drug police who are hell bent on convicting me and destroying my life. 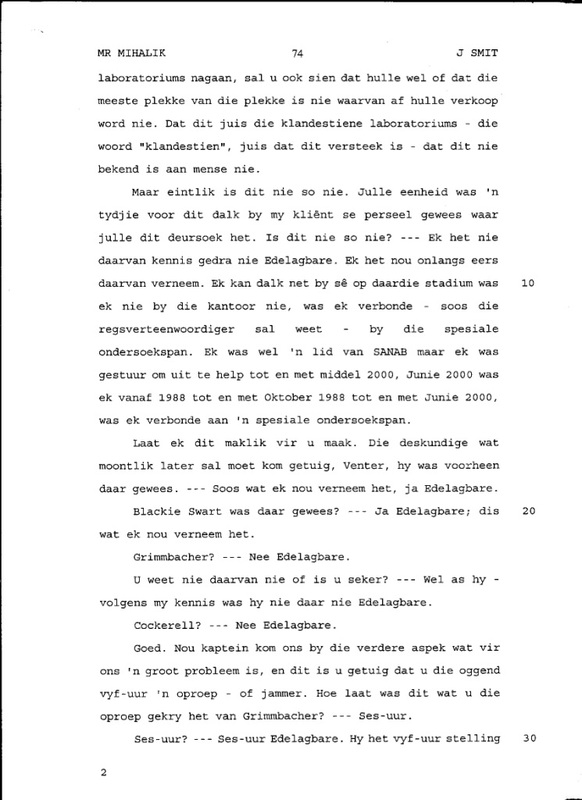 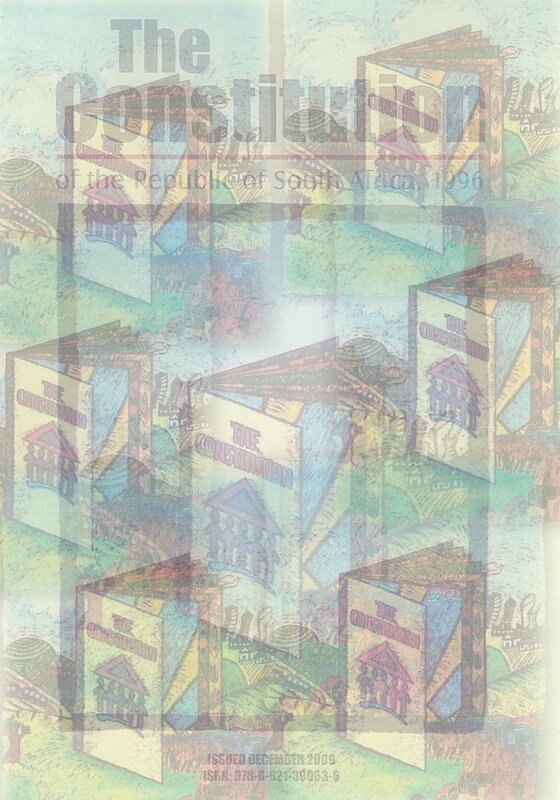 (The numbered pages below are from page number 45 to page number 168 and are presented here as jpg images. 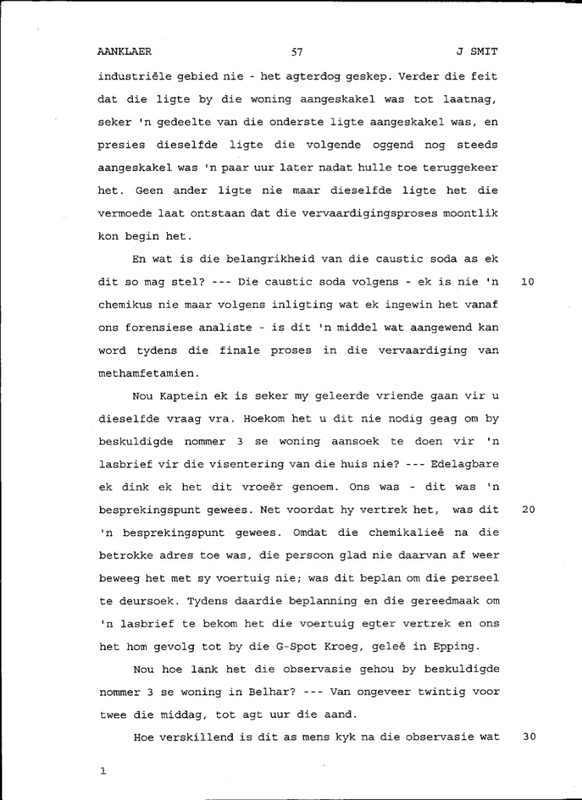 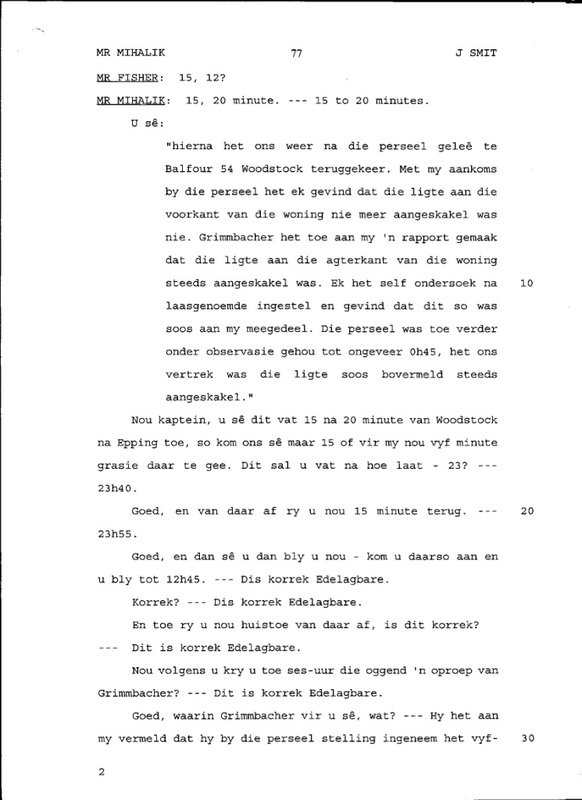 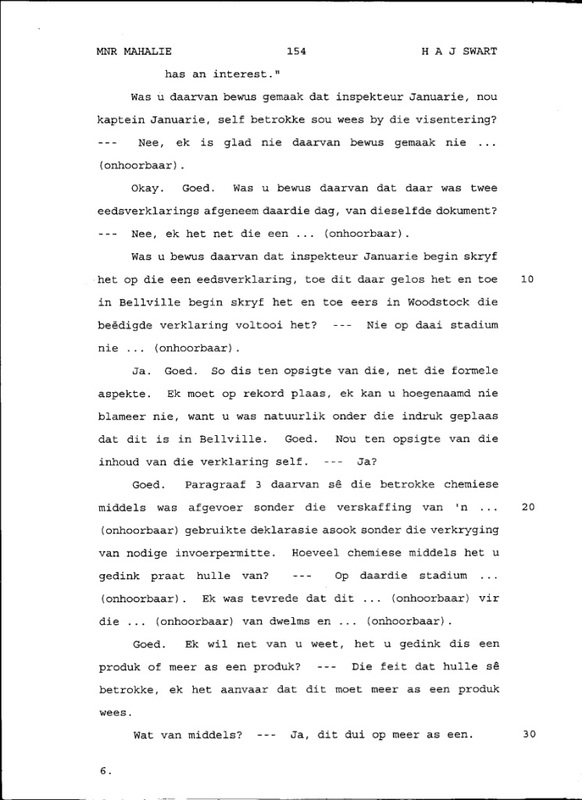 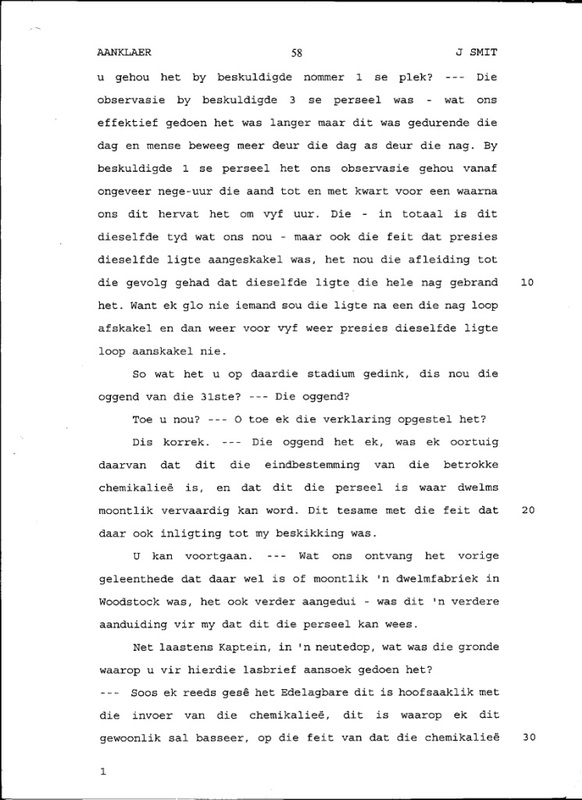 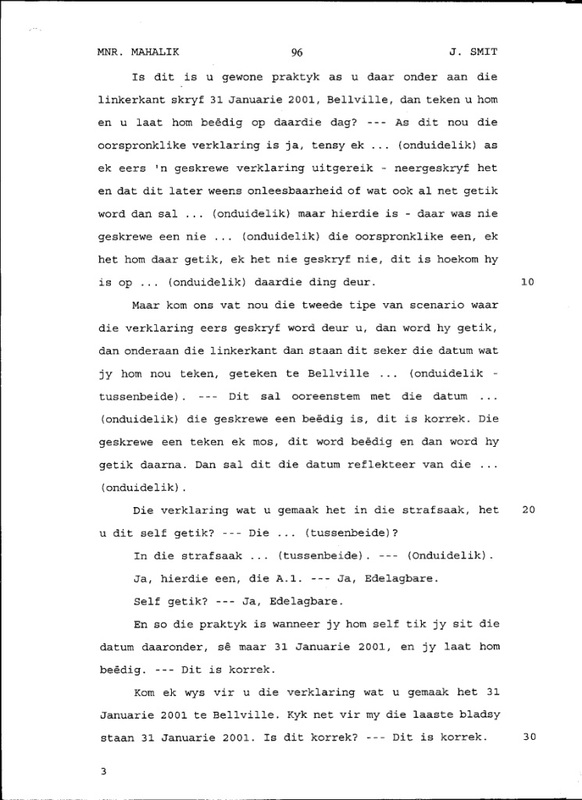 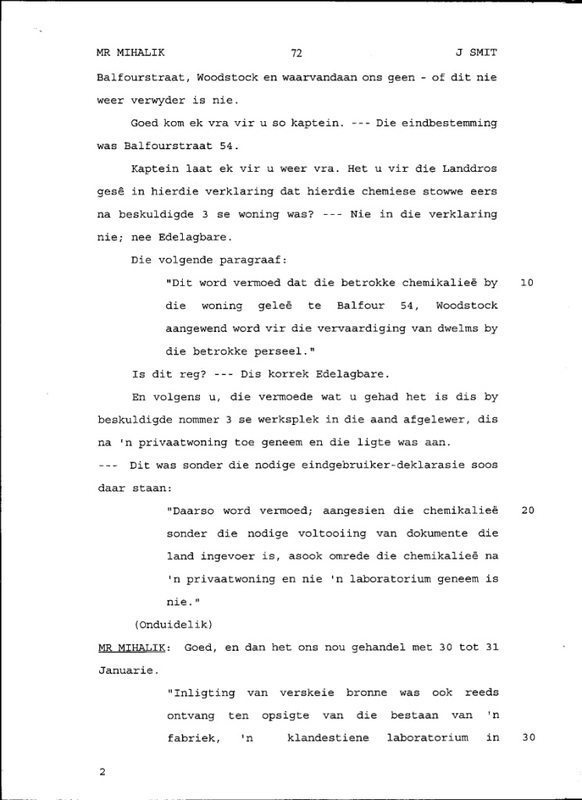 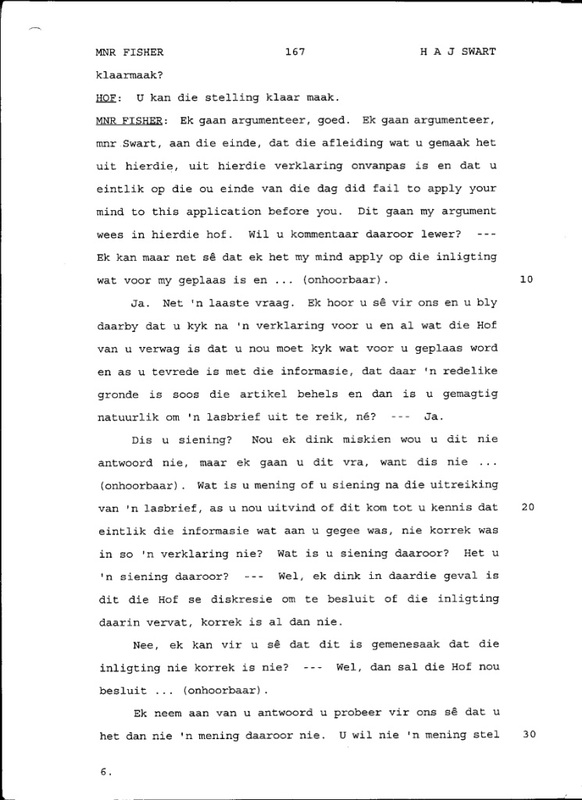 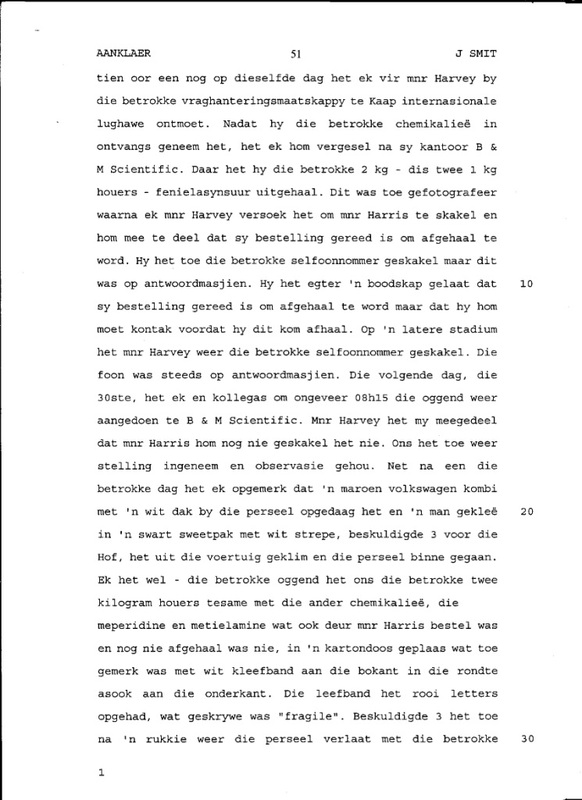 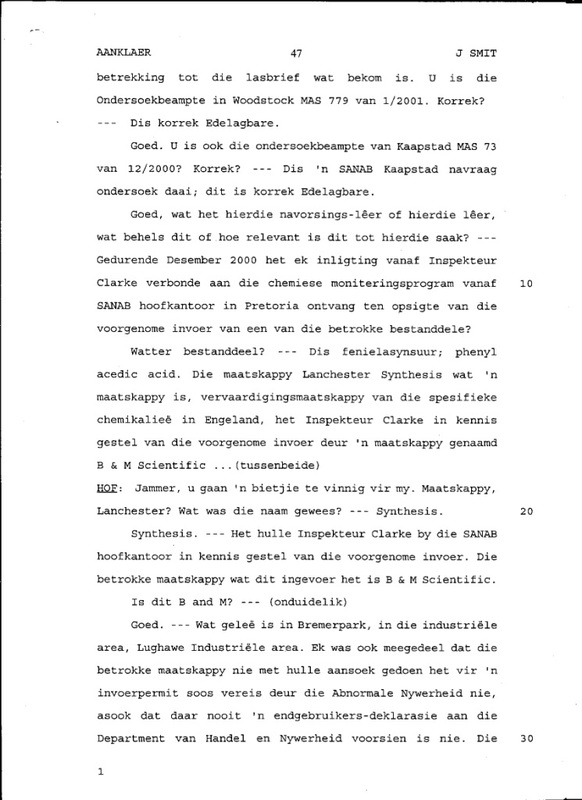 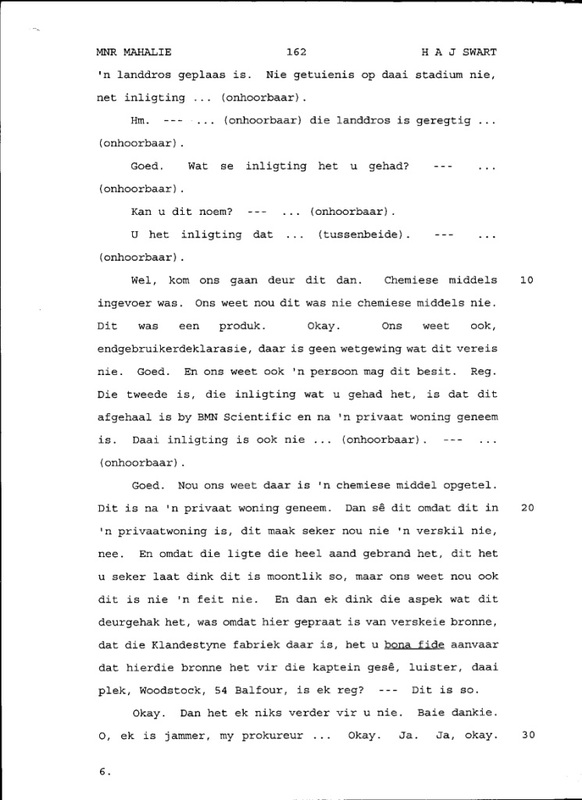 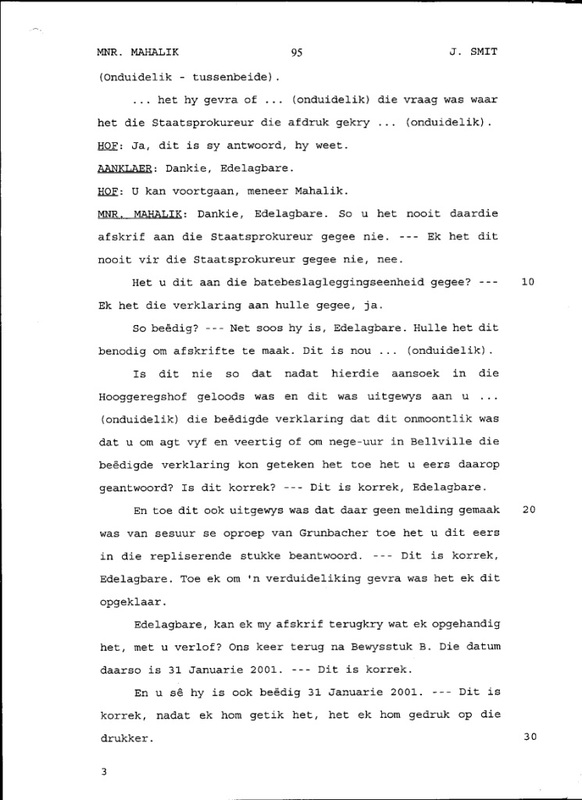 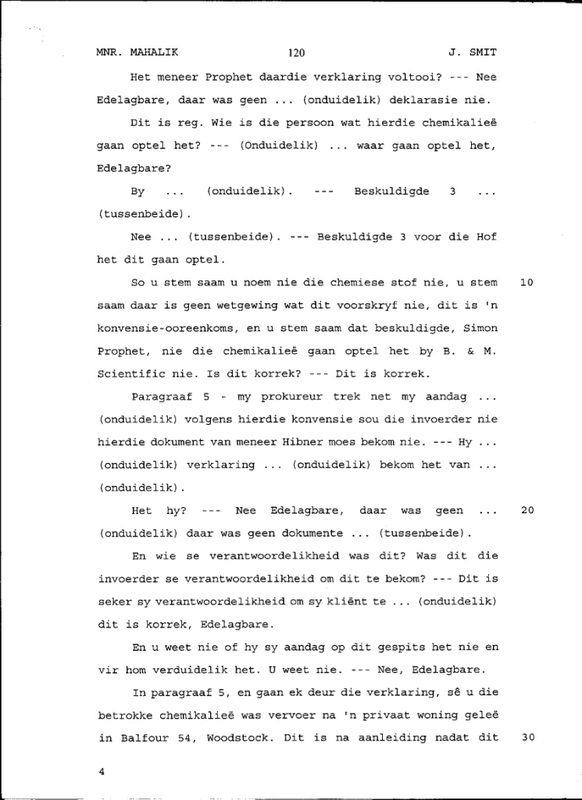 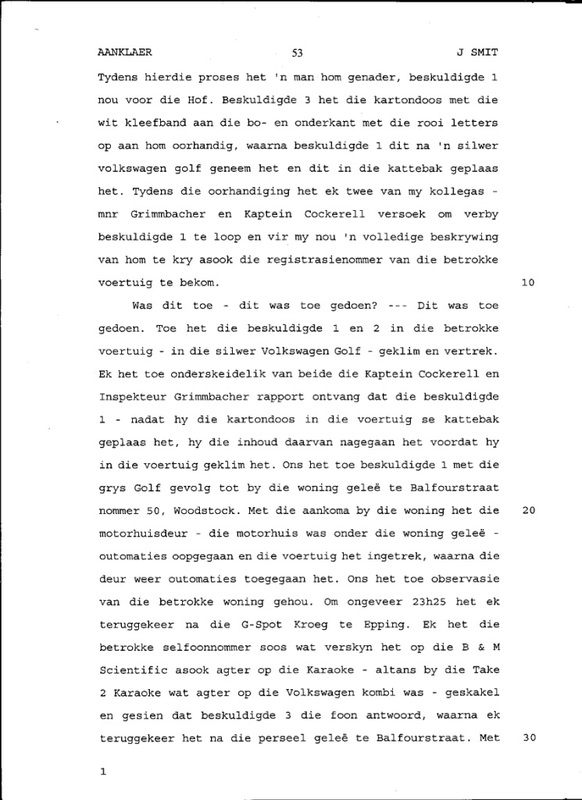 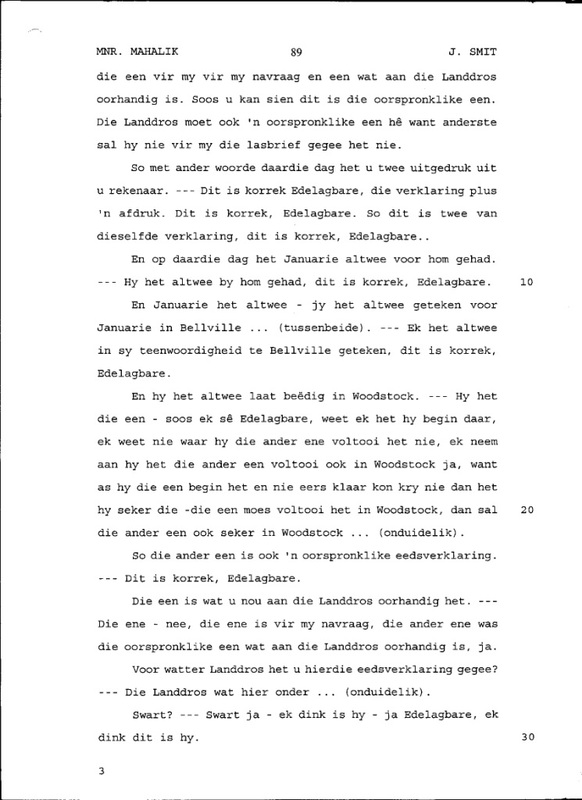 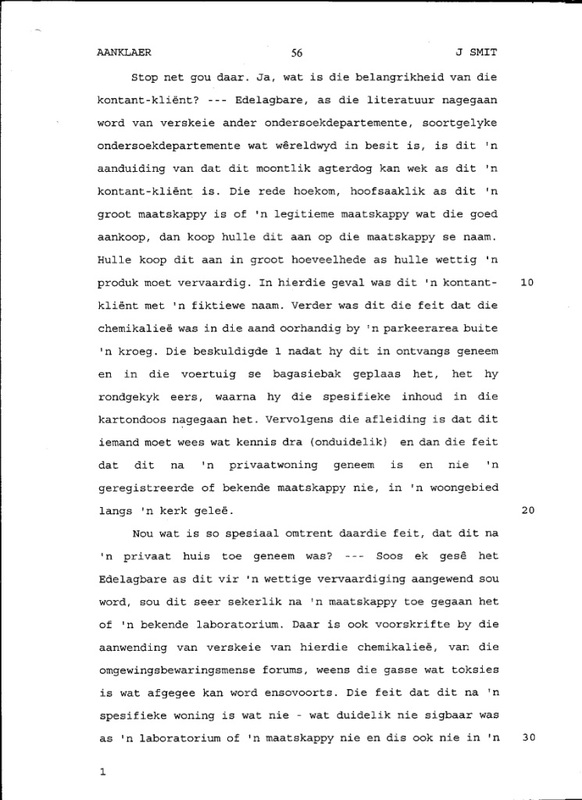 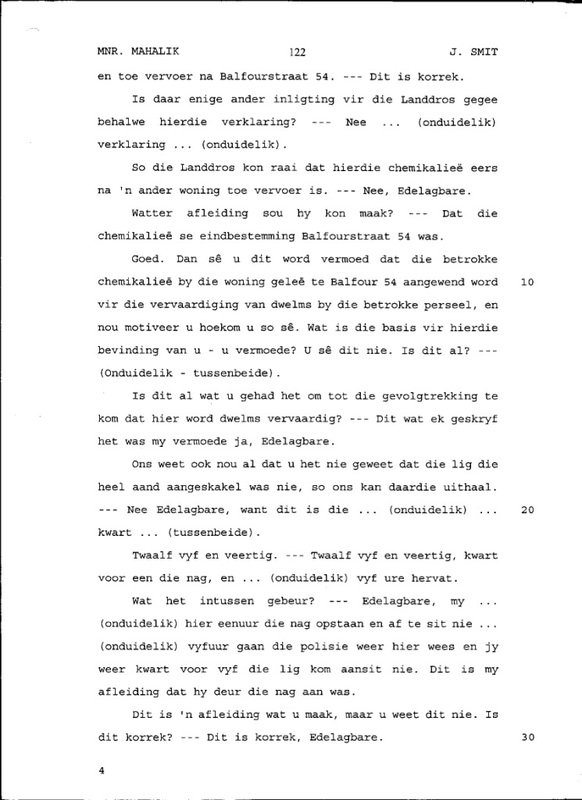 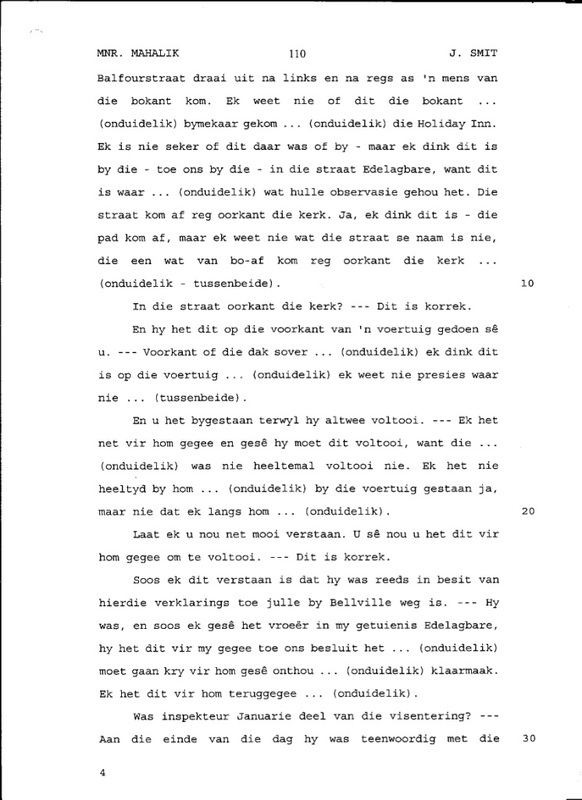 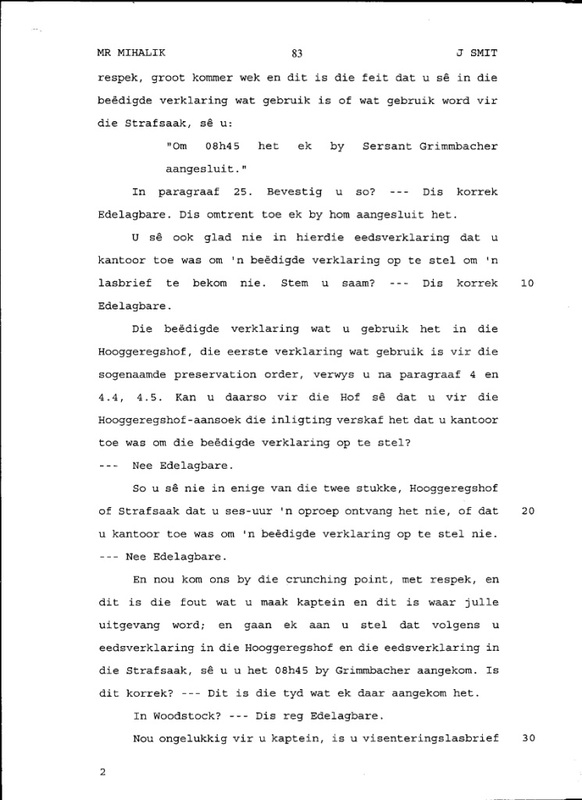 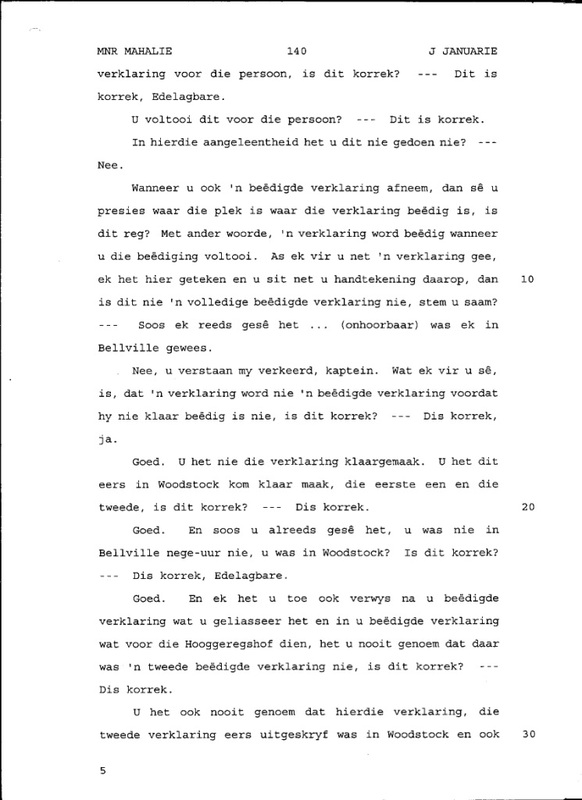 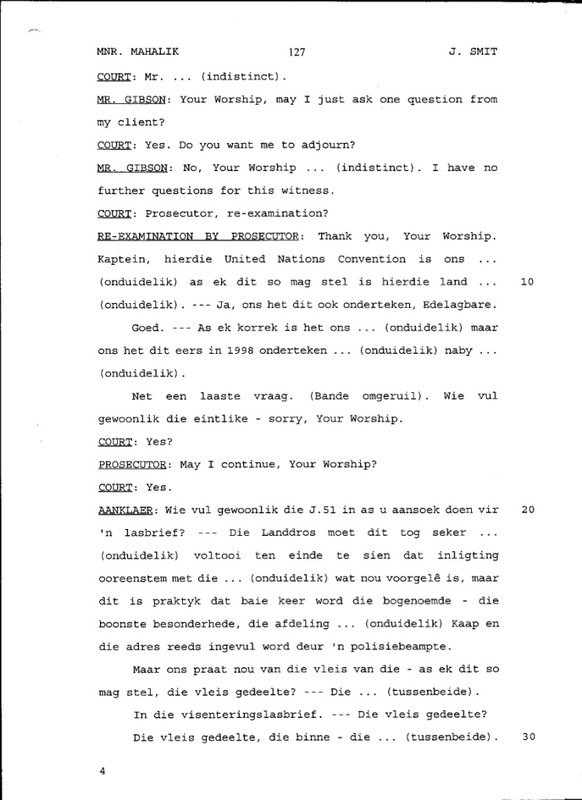 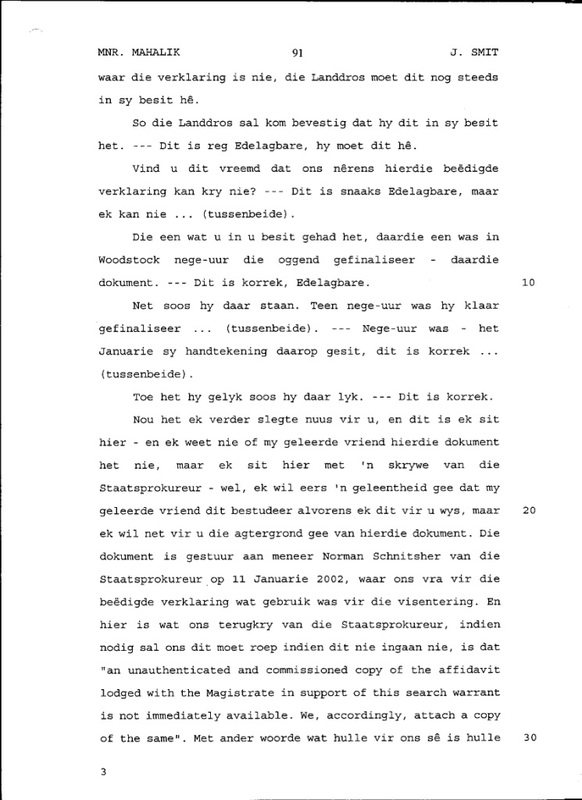 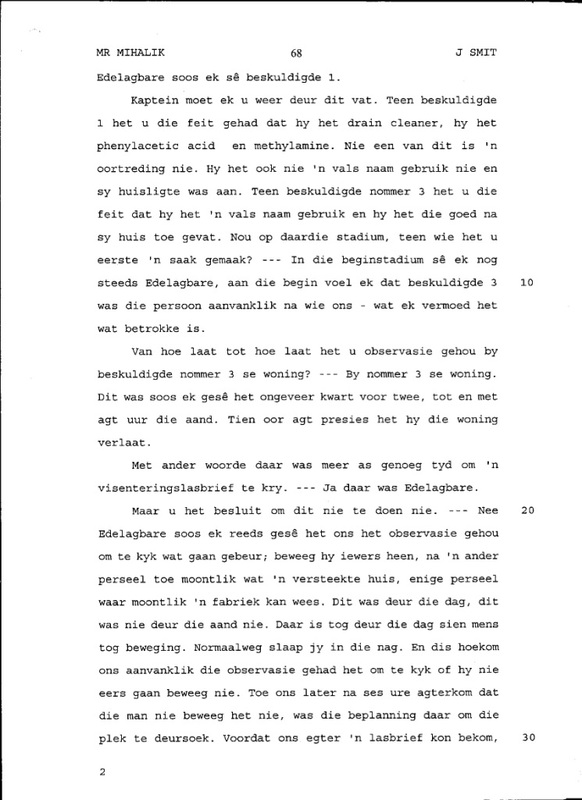 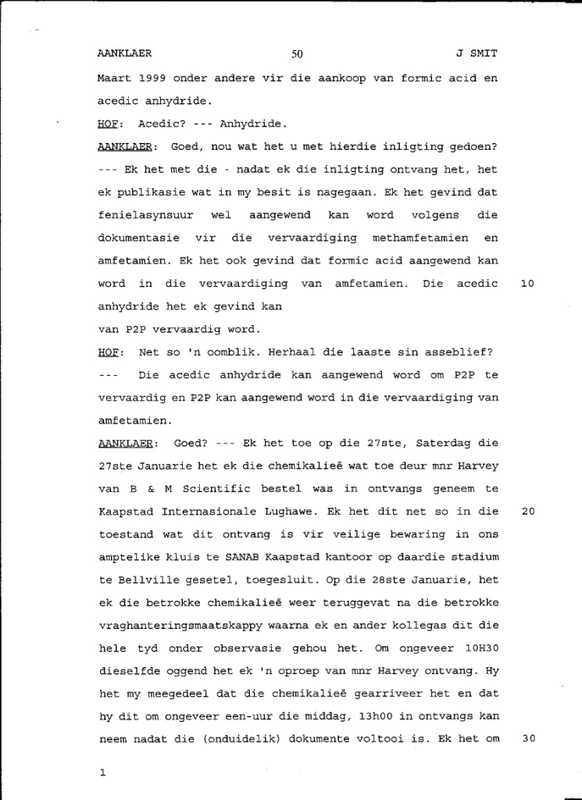 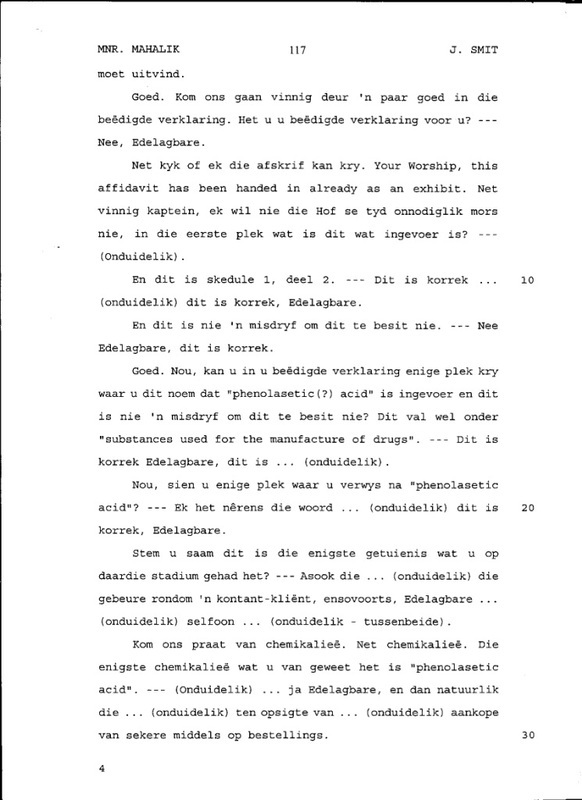 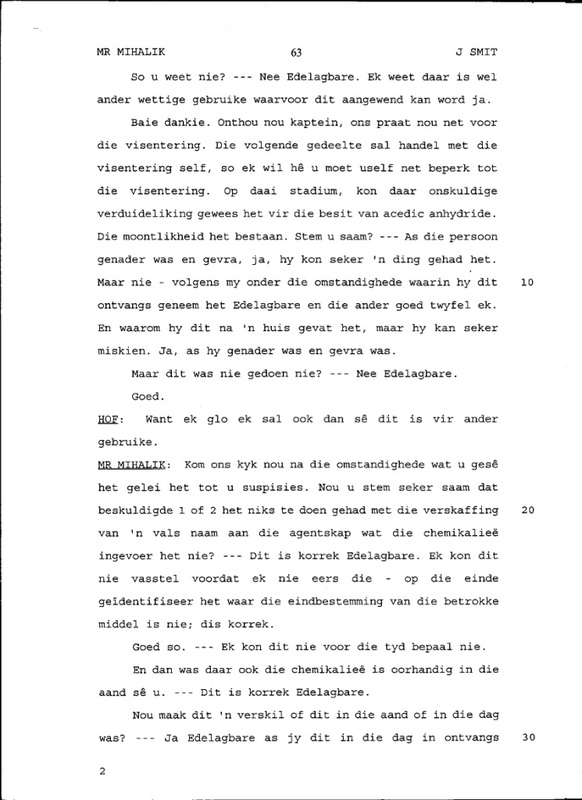 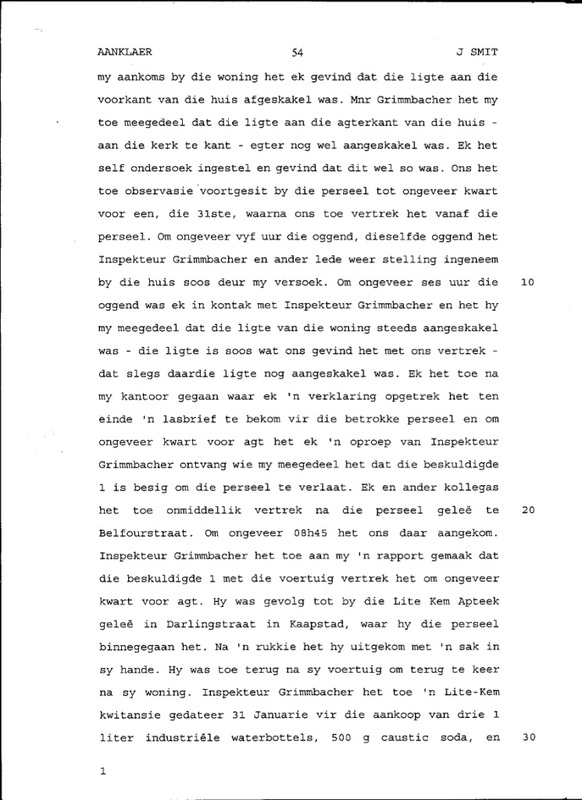 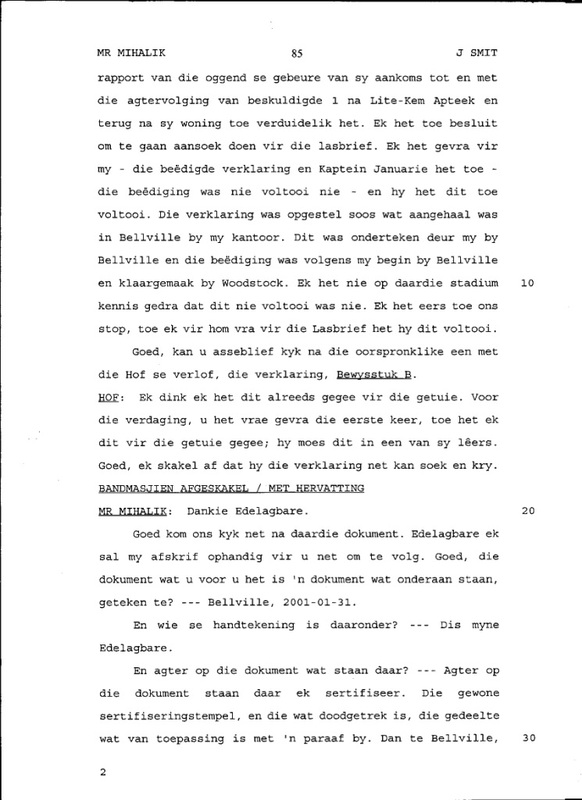 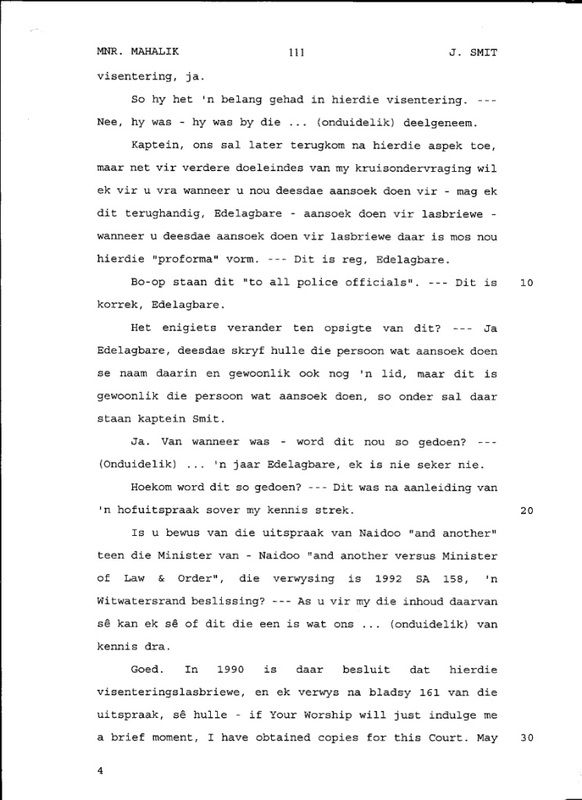 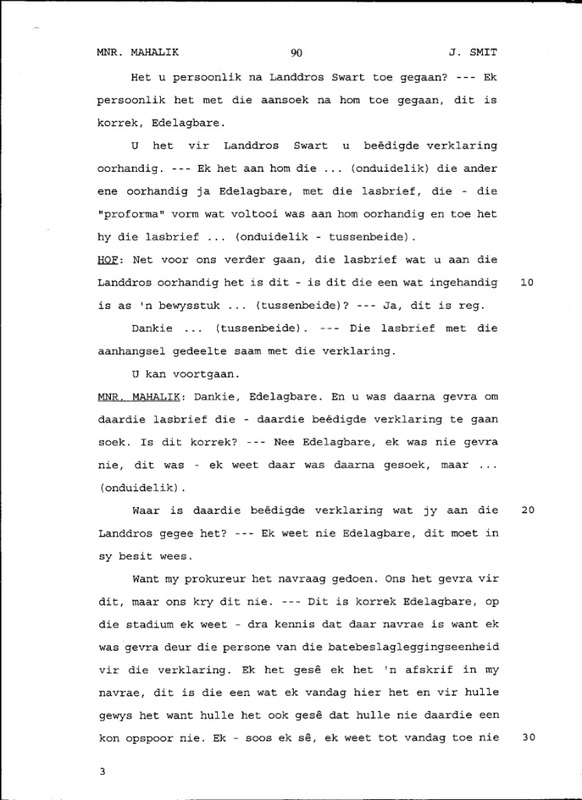 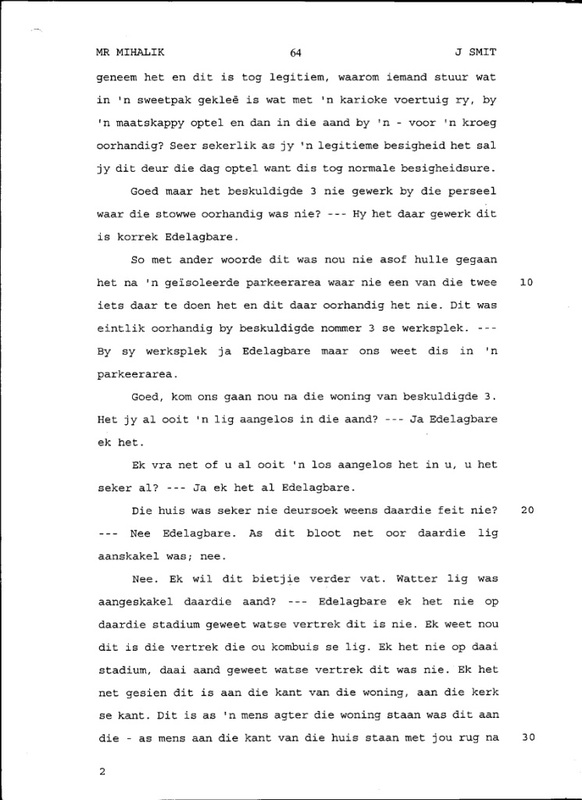 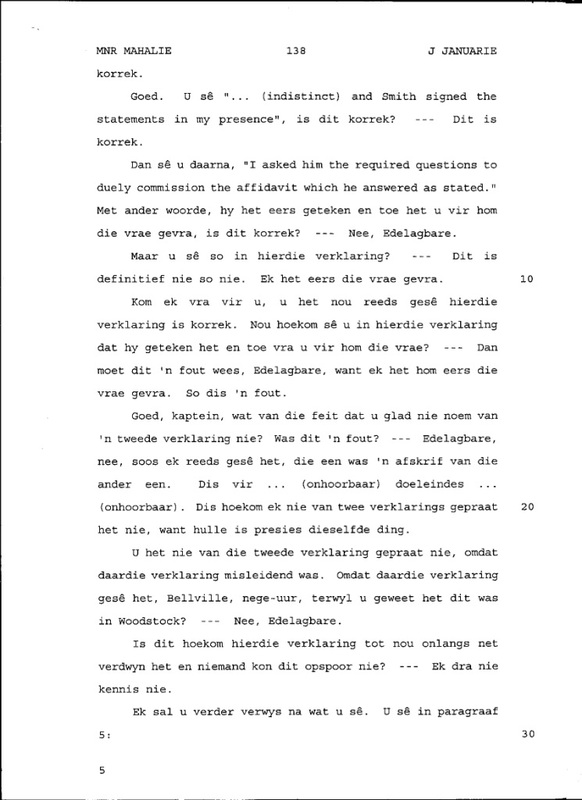 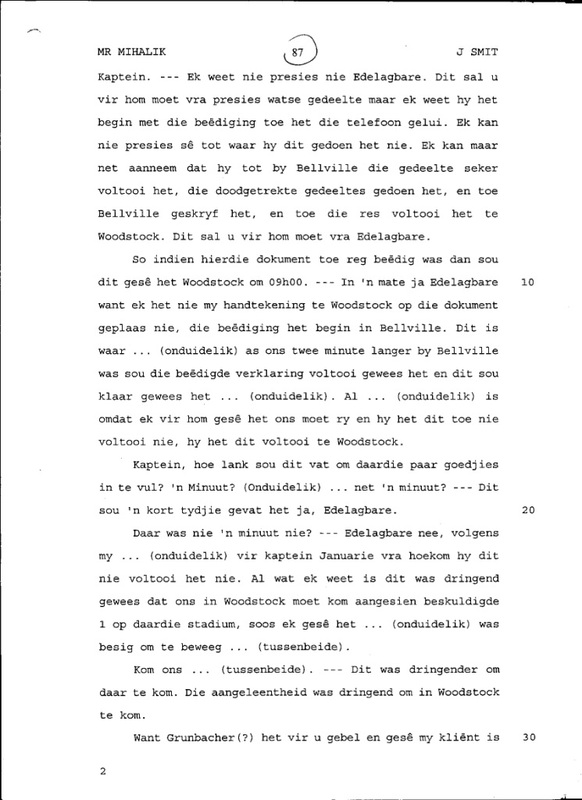 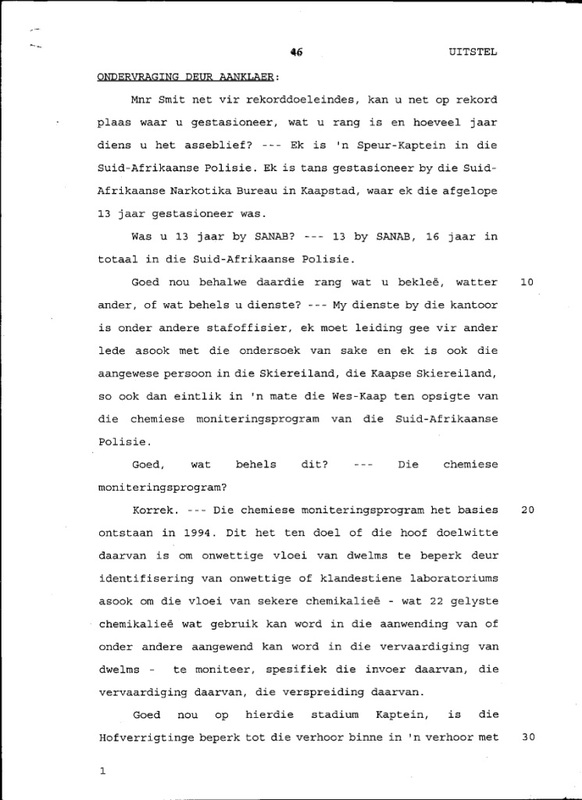 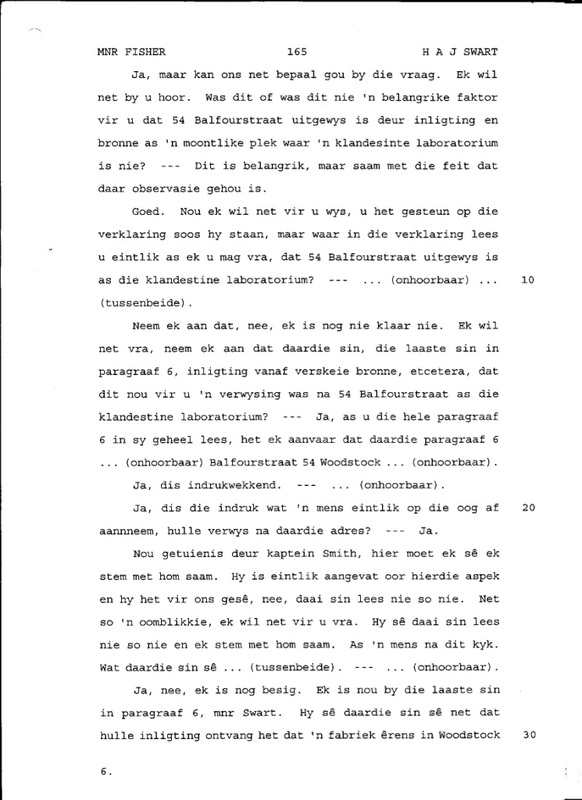 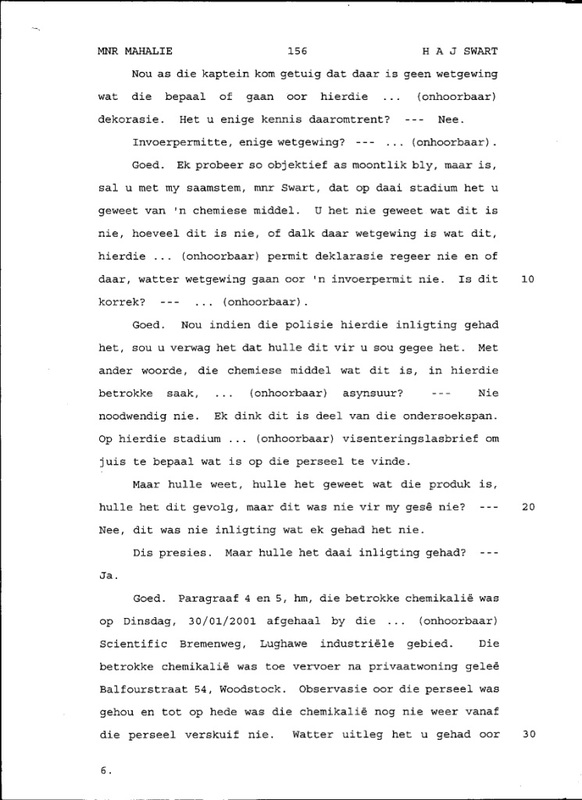 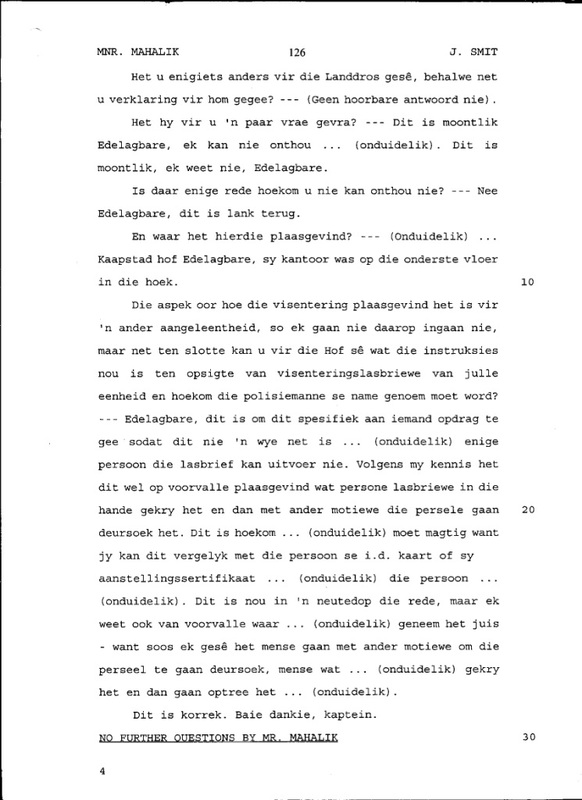 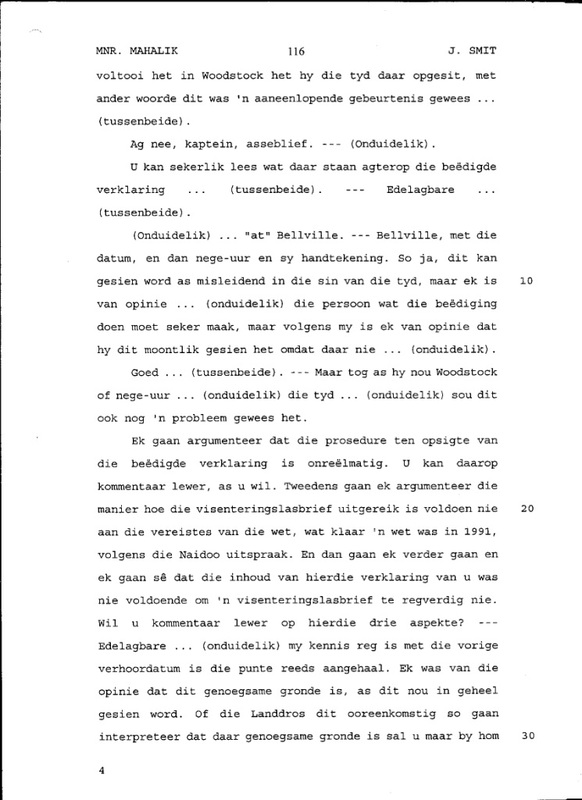 No member of the general public has ever made a drug related complaint against me and I was acquitted in two criminal drug trials and so then why was I punished but when I complained to the police about 4 crimes committed against me by the Director of Public Prosecutions, Rodney de Kock, then the police refused even to investigate my complaint? 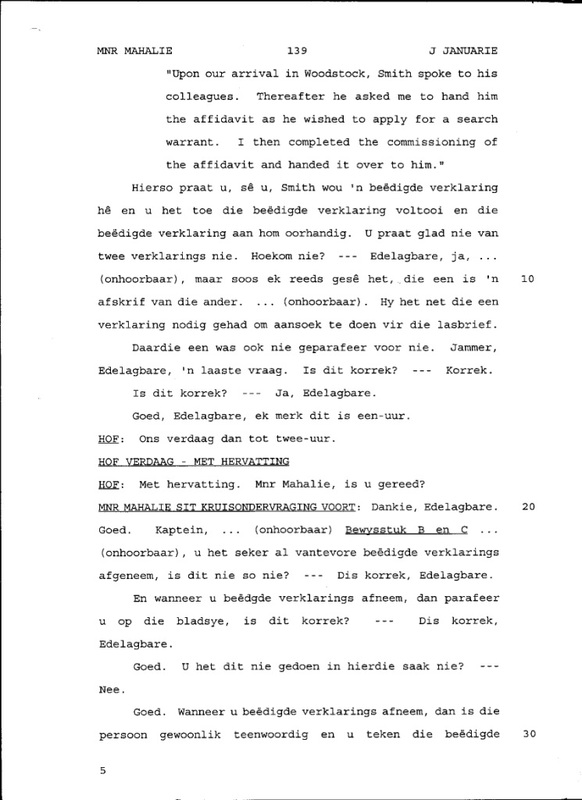 Are there different sets of rules for different players and where is the realm of fair?